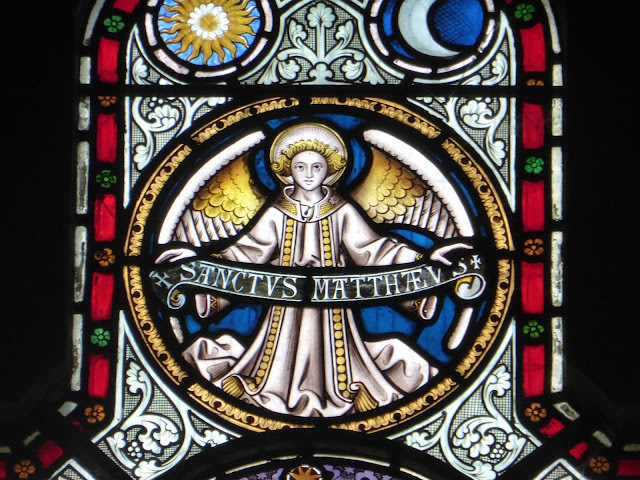 CAUTION: this post contains almost a hundred photographs of Victorian stained glass. 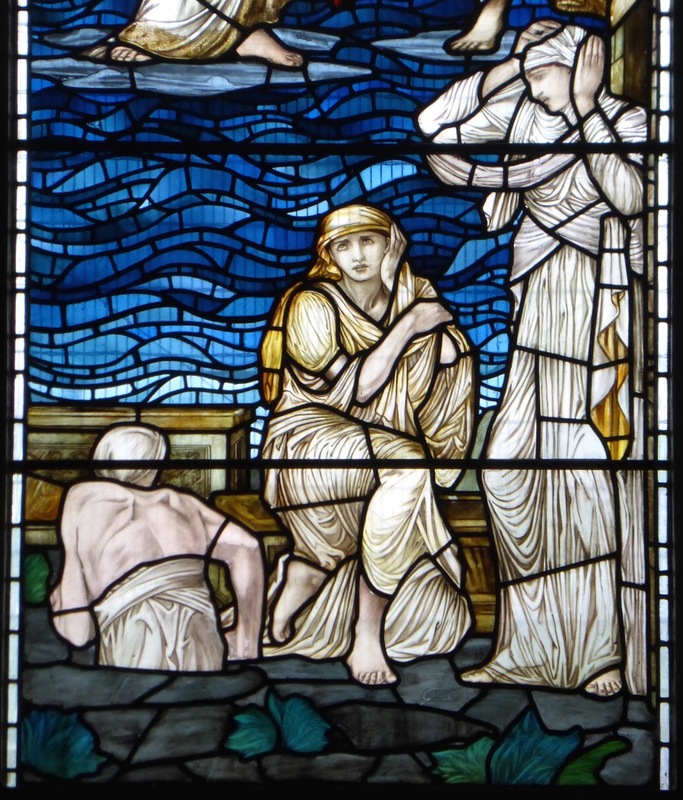 Those determined to dismiss the work of William Wailes, Nathaniel Westlake and their colleagues are likely to suffer from severe aesthetic shock; they are warned that the following pictures will induce potentially taste-threatening self-righteous shudders, and that they should look away now. Alternatively, viewing these images may cause them to be forced to re-evaluate their opinions, which in turn may lead to feelings of insecurity and self-doubt. In either case, the author denies all responsibility for any psychological damage that may be caused. 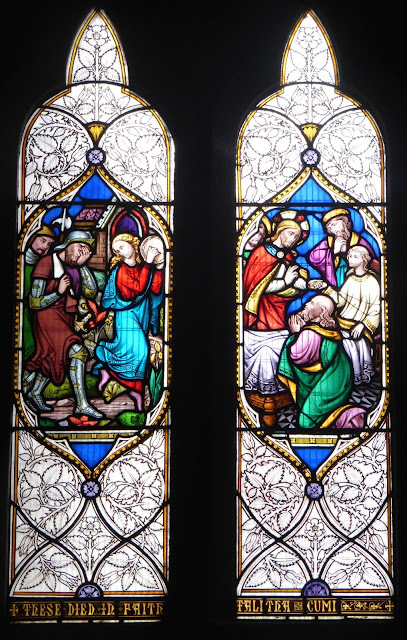 When I first started to visit churches, in the 70s, I took it as read that medieval stained glass was the only glass worth noticing, scorning anything more modern. I think my certainty on this subject began to be shaken when I visited Cambridge for the first time in 1978. (2) I went to Jesus College chapel (still one of my favourite buildings), and was astonished by the windows. I was almost certain that the east windows weren't medieval (they're not: they were designed by Pugin), but nevertheless they were (as I might have put it at the time) just about as good as those of the Middle Ages. 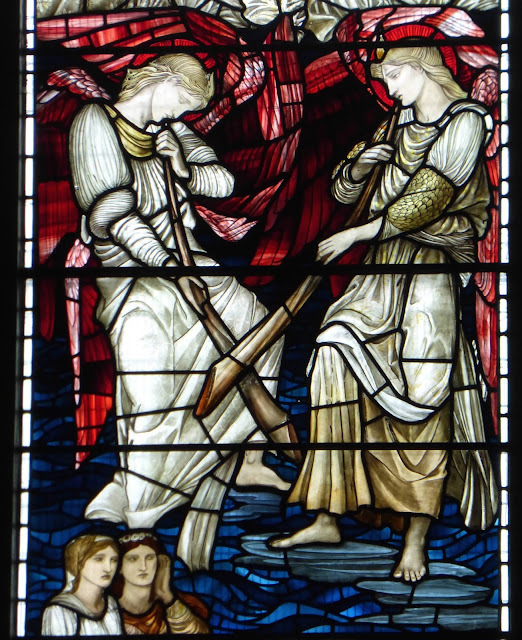 The other windows, by Burne-Jones, although in a very different style and obviously not medieval, also excited me. 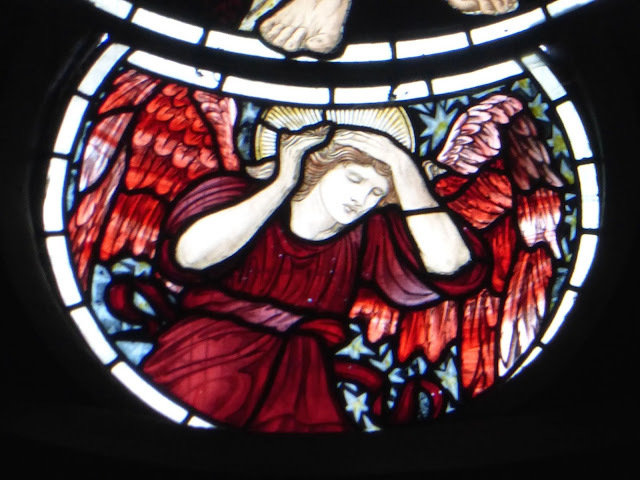 It took a while for my stubborn resistance to be worn down, but as I looked around more and more churches over the following years I gradually admitted to myself, grudgingly and shamefacedly at first, that the Victorian windows were often among the features I liked most. In recent years this widespread aesthetic snobbery (if Pevsner can accuse me of having a 'morbid aesthetic curiosity', I can retaliate by accusing him of being snooty) has waned somewhat as Victorian art has become generally more appreciated, but substantial traces of it remain. 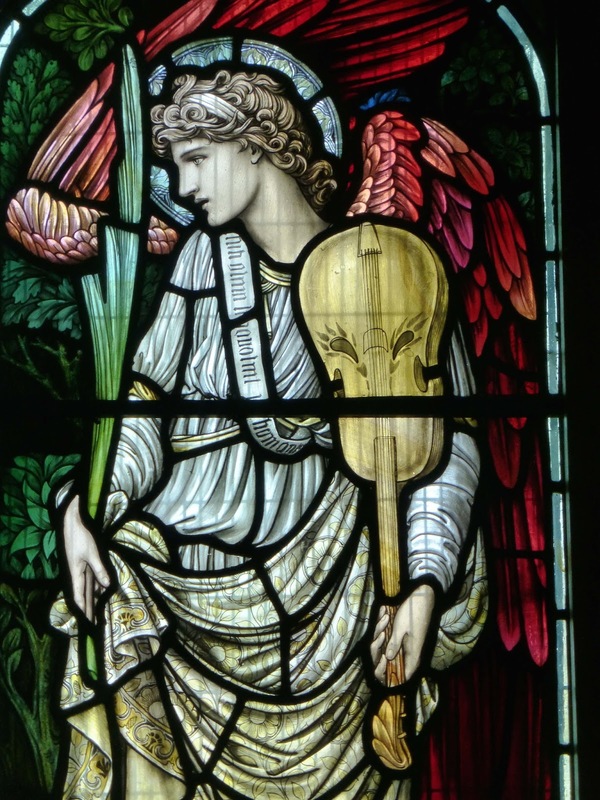 (Of course, there is plenty of mediocre and bad Victorian stained glass for critics to focus on if they're so inclined, but the same is true of every art form of every period.) 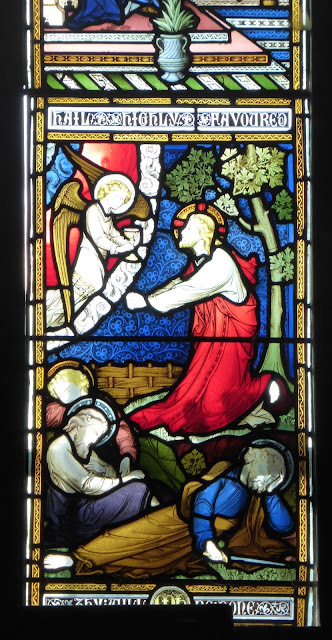 Martin Harrison's pioneering Victorian Stained Glass was published as long ago as 1980, but has had very few successors (3) (and is out of print and virtually impossible to find at a reasonable price (4)). The work of Morris & Co, and especially Burne-Jones (who even Clifton-Taylor acknowledged as praiseworthy), is almost universally appreciated, but Hardman & Co, Lavers, Barraud and Westlake, and William Wailes, to name just three firms, remain largely unchampioned. 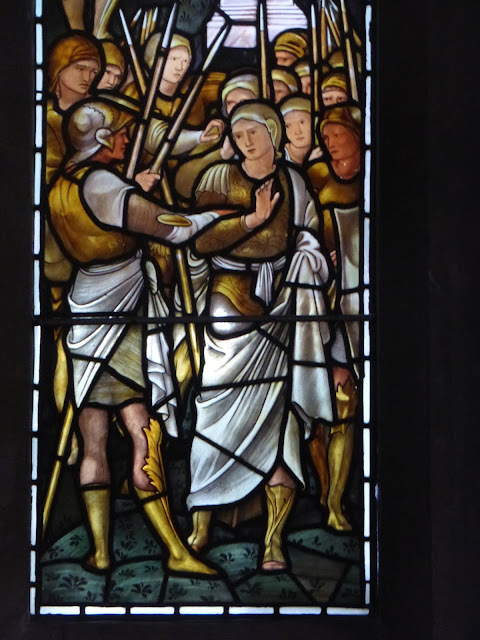 As a very small recompense for this lapse, I am going to discuss and illustrate thirteen Victorian windows, ranging in quality from the quite good to the outstanding, (plus one by Kempe). So, as I say, you have been warned. Readers of a nervous disposition should find another blog to read right now. 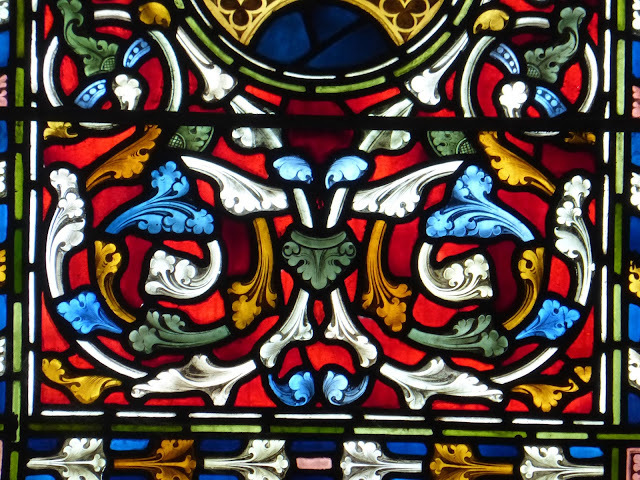 At the top is a roundel surrounded by six lobes. The roundel contains a youthfully handsome (if androgynous), long-haired figure of Christ (it’s hard to be sure, as perhaps it’s just that the paint has faded, but has he got his eyes shut? 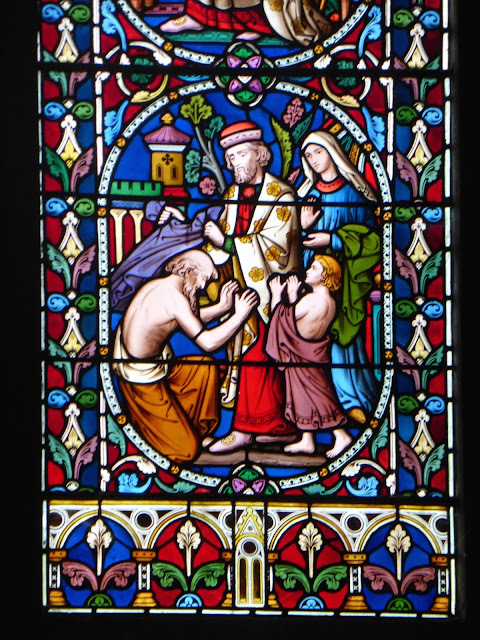 ), displaying his stigmata and wearing his crown of thorns. His burial shroud billows behind him, and has greenish-yellow marks on it (some of them apparently in the shape of arrowheads). 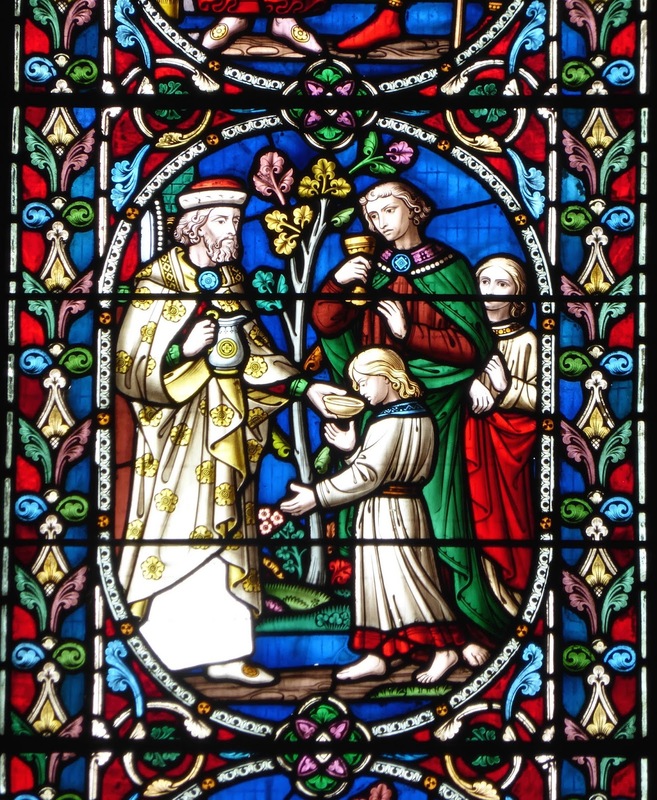 Green can symbolise both death (being the colour of putrefaction) and life (as foliage is green), and so is highly appropriate in an image celebrating the triumph of life over death. He raises his right hand in a visually powerful gesture, signifying - what? 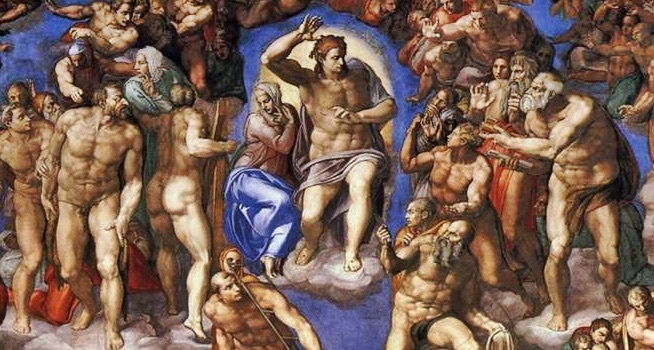 It’s very similar to that of, for example, Christ in Michelangelo’s Last Judgement, and there the gesture is directed towards the damned, saying, in effect, that they should abandon hope as he is condemning them to suffer in Hell for all eternity. 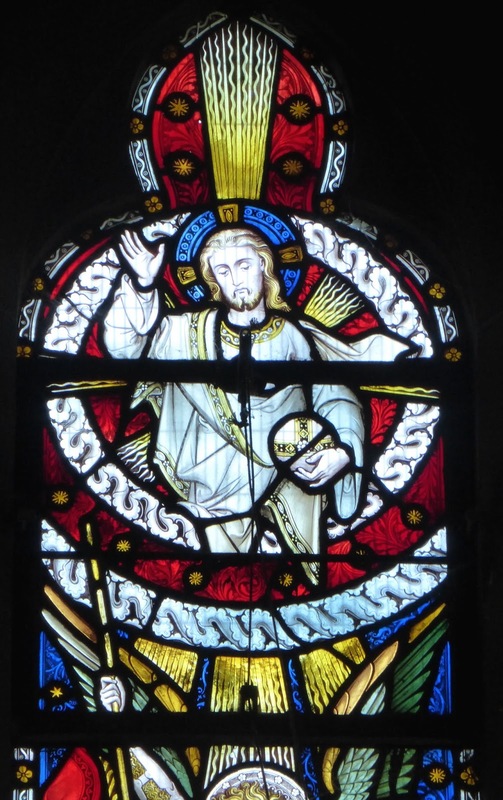 However, in this window there is no obvious hint of damnation; perhaps we should read his raised right hand as a gesture of blessing to the newly resurrected. 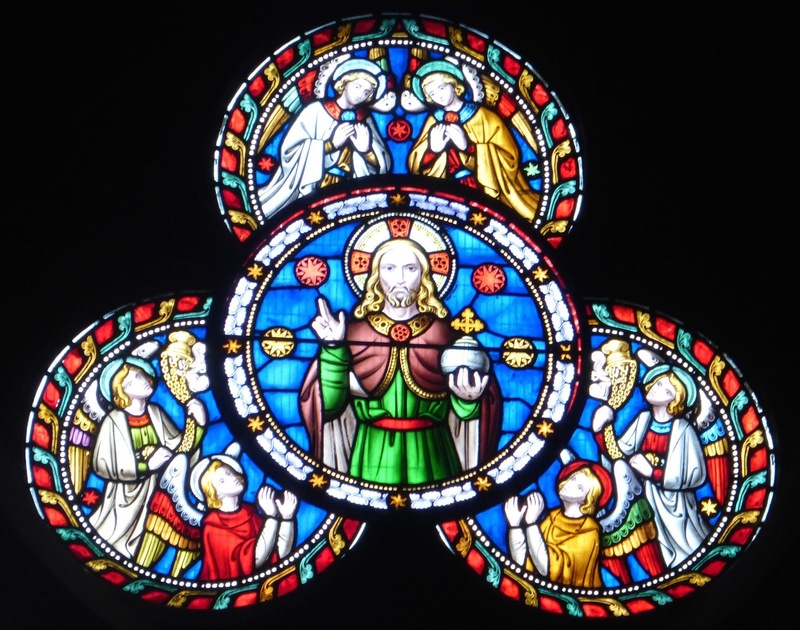 Christ is surrounded by stars, symbolising Heaven; they must have been freely drawn as many of them are pleasingly irregular - if you look you’ll find some with five, six, seven or eight points. 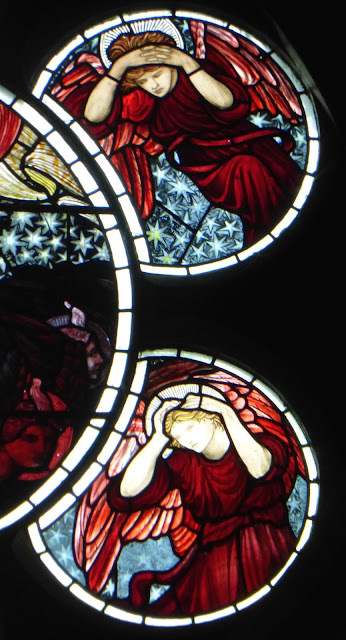 To either side of him are also the heads of four angels, though they’re quite difficult to see, with flames issuing from their foreheads (which identifies them as Seraphim, the most senior of the angels; Seraphim are generally thought of as having six wings, but Burne-Jones gives them only two). The six angels in the lobes are dressed in gorgeous robes (with dramatically snaking belts) the colour of communion wine; their luxuriant wings are similar. They all have their hands to their heads in gestures that could be taken to mean apprehension, anxiety or even horror, but awe is probably the intended emotion. 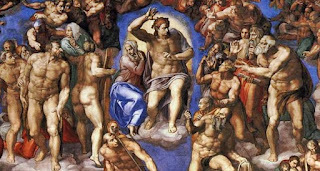 After all, they’re witnessing the resurrection of humanity. 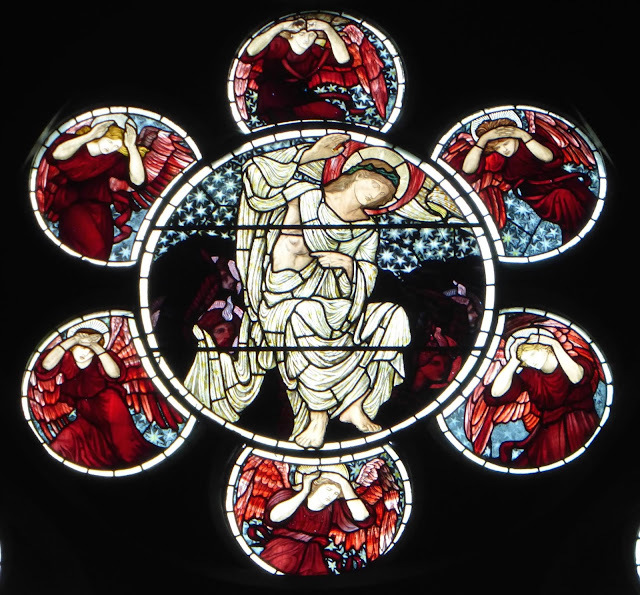 At the top of the two outer main lights two more angels look down, and beneath them the twelve apostles also contemplate the events on earth. 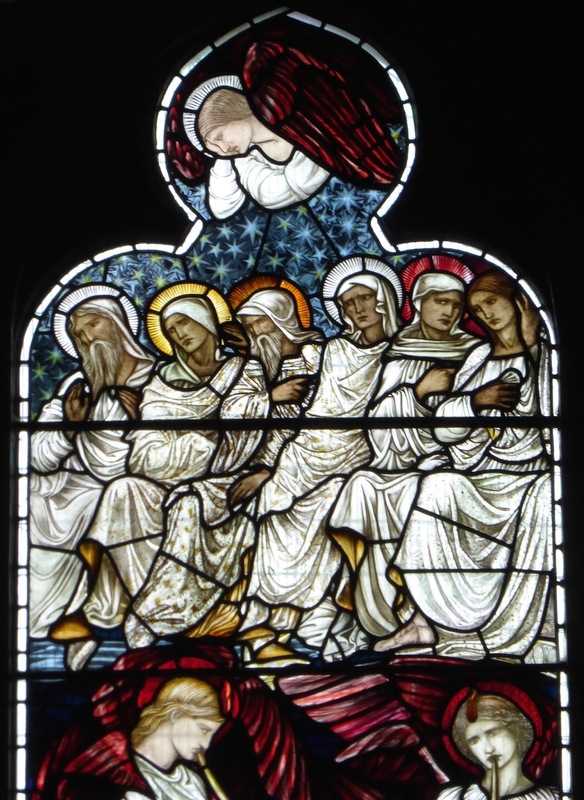 In my post about the Pre-Raphaelite glass in Middleton Cheney, Northants, I gently ribbed Burne-Jones for his propensity to make all the figures in his designs look very similar, and, while he’s done his best to vary his apostles, they do still look like one model who’s burrowed in the dressing-up box: different coloured haloes, stage prop beards, plain white robes or white ones with patterns, several different poses and facial expressions, but essentially one face. 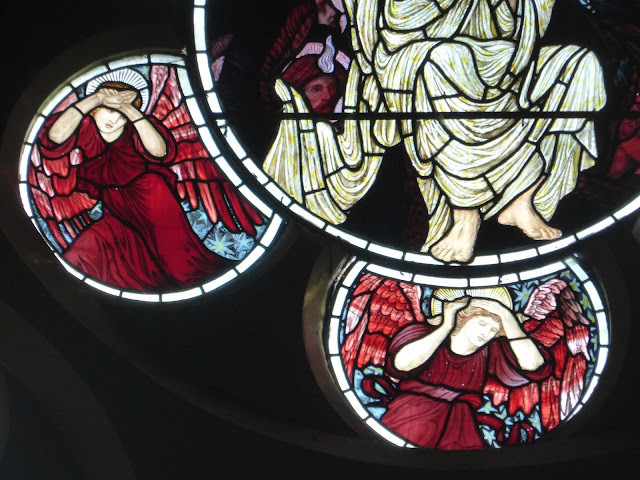 Four of them (on the left) clutch their hands together in prayer, four of them clutch a hand to their chest as if experiencing great tension, one of them (on the left of the right light) raises his hands in surprise, and one (on the right of the left light) seems to have nodded off and is resting his head on his hand. 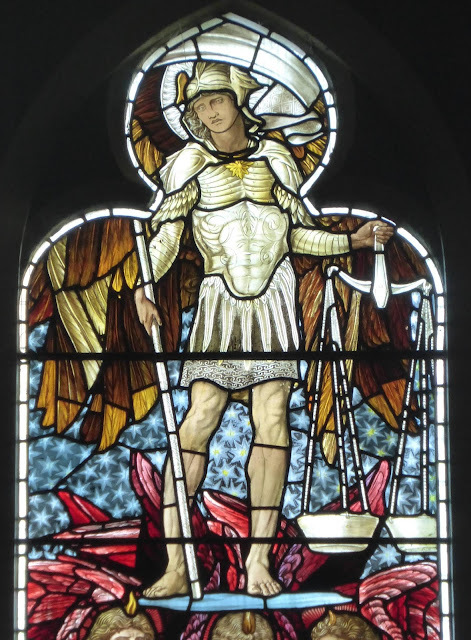 St Michael stands at the top of the central light, a heroic figure, holding a staff and scales (with which to weigh and judge souls). His lorica segmentata armour is based on Roman models. His wings, though displayed proudly behind him, aren't as luxuriously coloured as those of the Seraphim as he's an Archangel, and thus some way down the Heavenly pecking order. 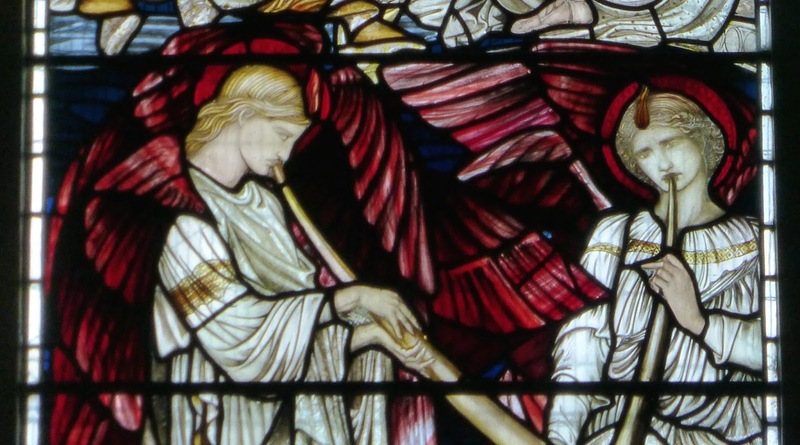 The transition between this tier of figures and the trumpeting or reading angels below is the weakest part of the design, especially in the central light, where whatever St Michael is standing on (a sliver of sky?) looks to be perilously balanced on the angels’ heads. 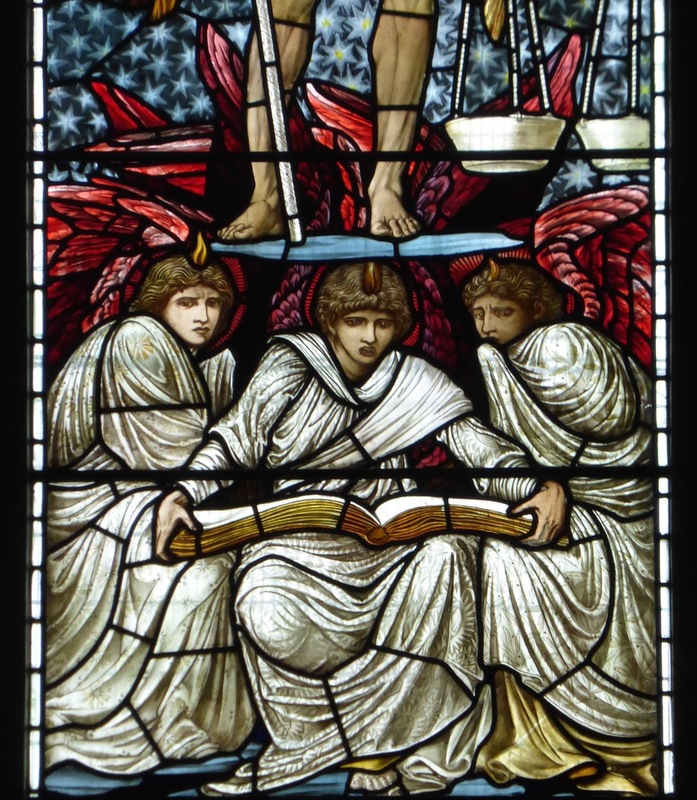 Nevertheless, I very much like the seven angels in the middle tier, especially the two on the left who blow the last trump so languidly. 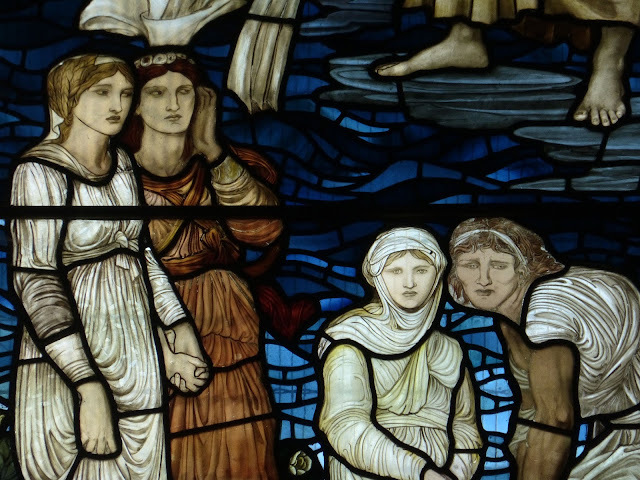 They look like female aesthetes who’ve been roused from bed unexpectedly early after a night’s carousing. The three recording angels in the middle consult the book in which all sins and good deeds are written. 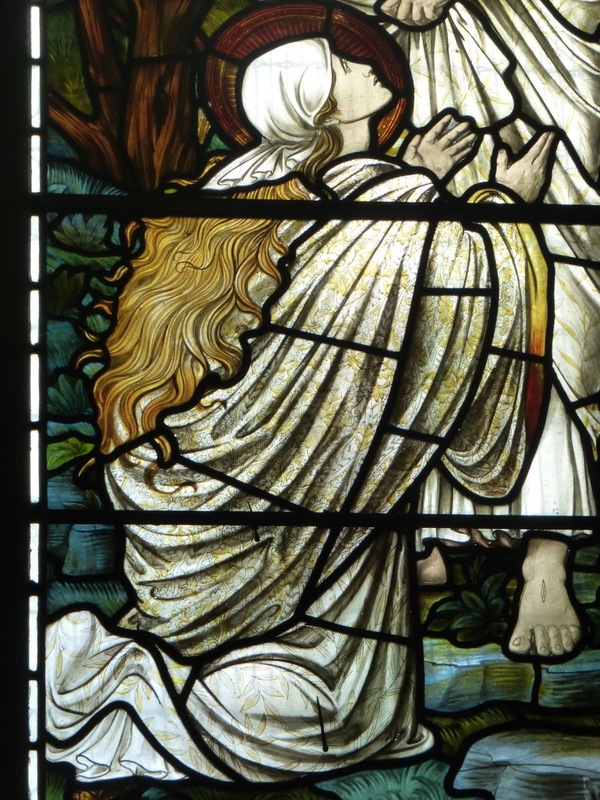 They have typically Pre-Raphaelite very full, very red, very sensual lips. 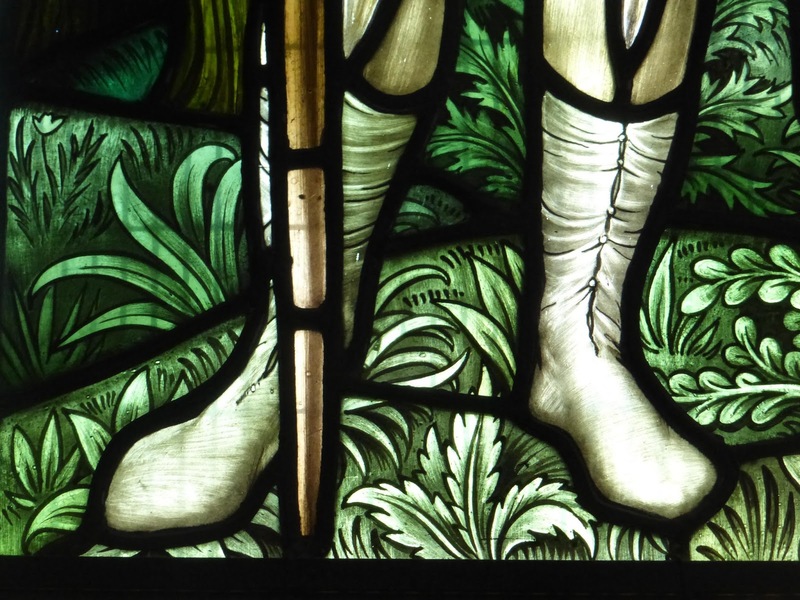 Where are they looking - down to earth, or at us, the viewer? Those on left and right certainly seem to be giving direct address, which draws us into the image. We too, they imply, will one day be held to account. 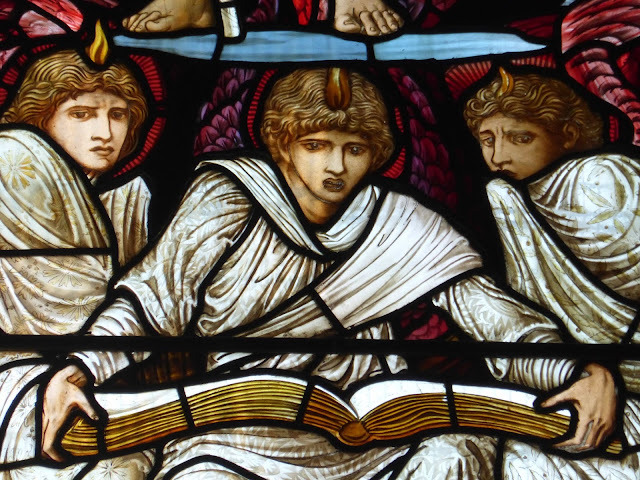 The one on the right covers his/her/their (angels are asexual, so it’s unclear which pronoun should be used) mouth as if they can hardly bear to watch. The bottom tier depicts resurrecting humanity. On the far left two women hold hands - perhaps they're recently reunited sisters. One cups her ear to better hear the last trump; all the others are dressed in their burial shrouds (or are naked), but she seems to be wearing an embroidered underdress. Next to them two other women stare straight out of the window at us, like the recording angels, and with similar effect. (Don't you think there's something a bit odd about the face of the one on the right? 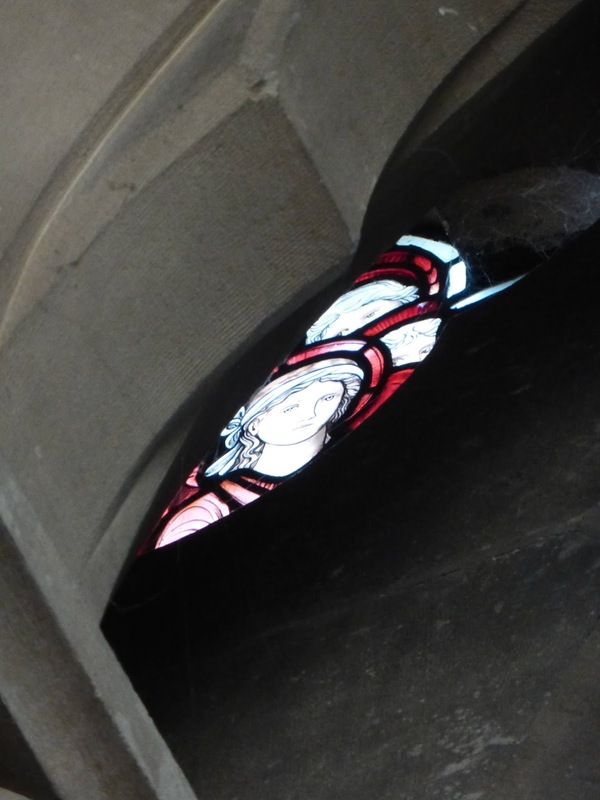 It looks as if that bit of glass has been painted by an only semi-competent artisan.) Meanwhile, beneath them, Roger Daltrey is struggling from the rocks. 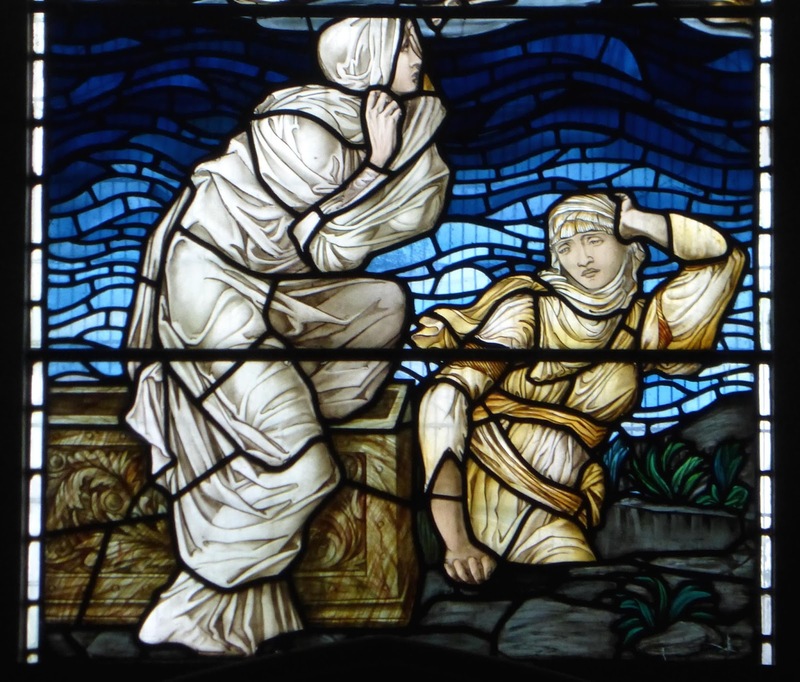 In the central light one woman climbs from a sarcophagus while another emerges from the rocks, looking very bleary-eyed. 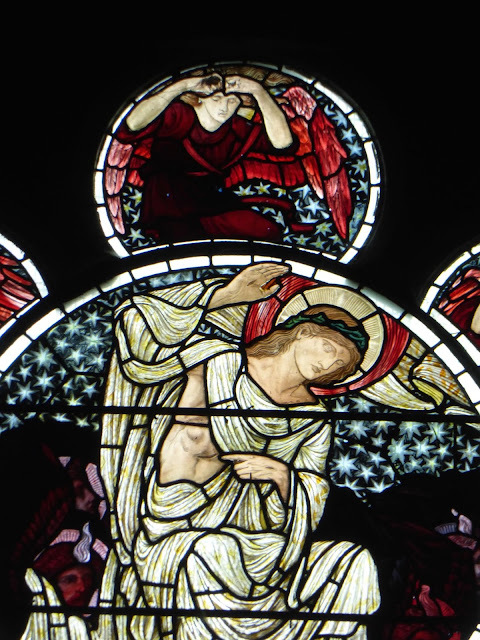 In the right light, one figure reacts with astonishment to the resurrection of two others. 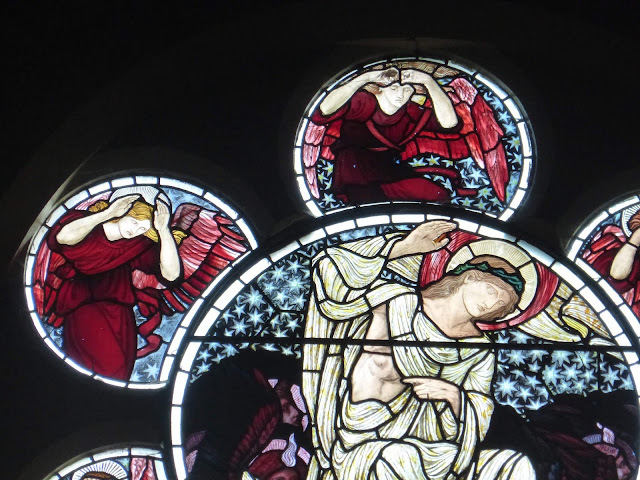 This is a good place to consider Burne-Jones' highly dramatic use of leading, which turns the sky, which could be a bland and featureless expanse of blue, into a churning sea; highly appropriate for the Day of Judgement, in which the resurrectors can either sink or swim. However, apart from St Michael's scales there is little suggestion in Easthampstead that any judgement is happening; no one seems to be sinking. 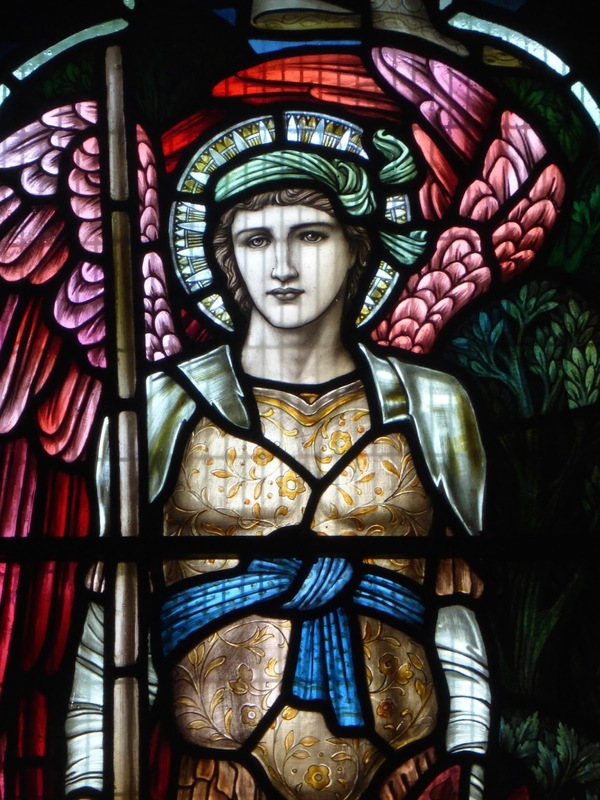 (Unless Christ's right hand is indeed deeming damnation, and the angels' hands-to-head gestures can be read as meaning that they are aghast at what they know to be the terrible fate of some of the resurrectors.) 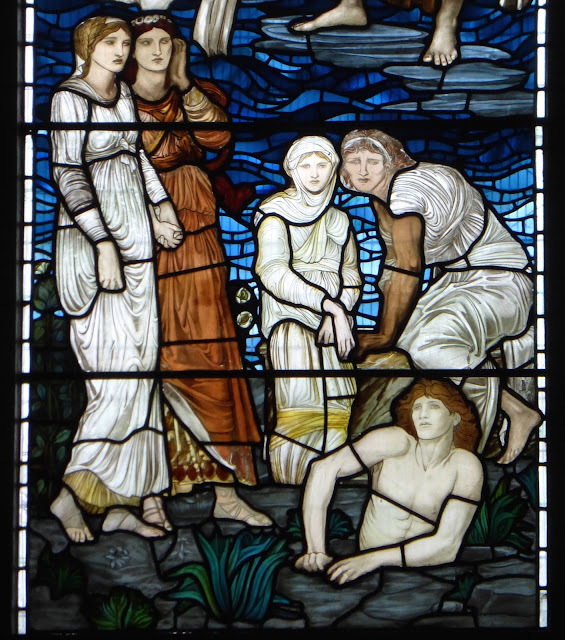 All those resurrected look equally innocent (and, incidentally, the majority of them are female). 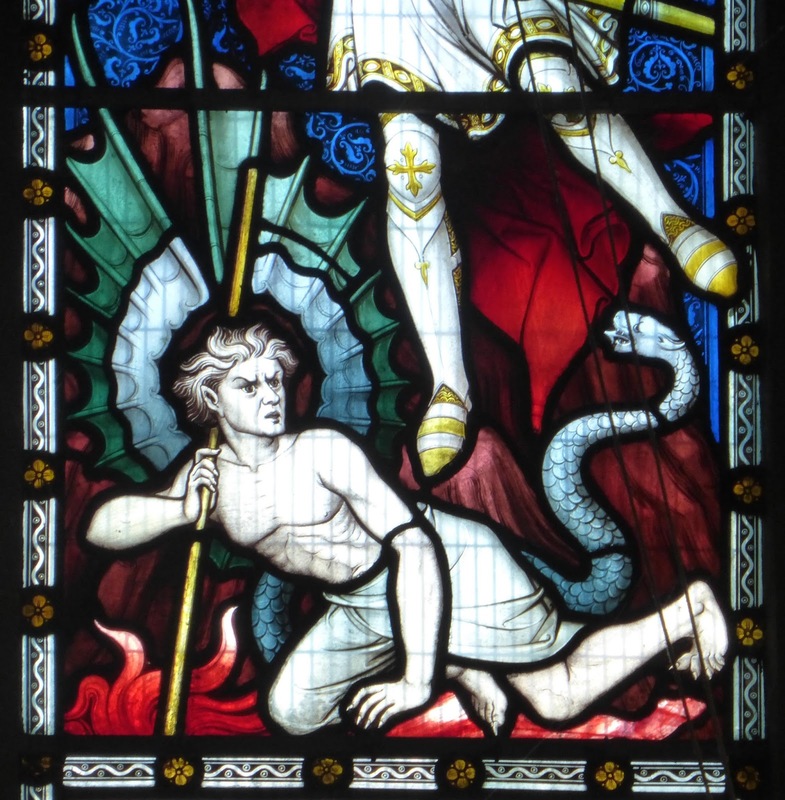 The Church in the Middle Ages revelled in promulgating the doctrine of damnation, whereas by the Victorian era it shied away from doing so; (whether this was because of a doctrinal shift, or because it no longer thought that telling about half its congregation that they were going to Hell was good PR, I'll leave to better informed scholars). Burne-Jones had studied theology as a young man at Oxford but had later lost his faith; does this mean that because he didn't believe in the Last Judgement (as the makers of the Fairford window undoubtedly did), that therefore his window lacks sincerity, that he is simply play-acting? I find it hard to accept that this could be true. Most of the rest of the windows don't need such a detailed commentary. They're shown below as they appear in the church, clockwise from the east window. 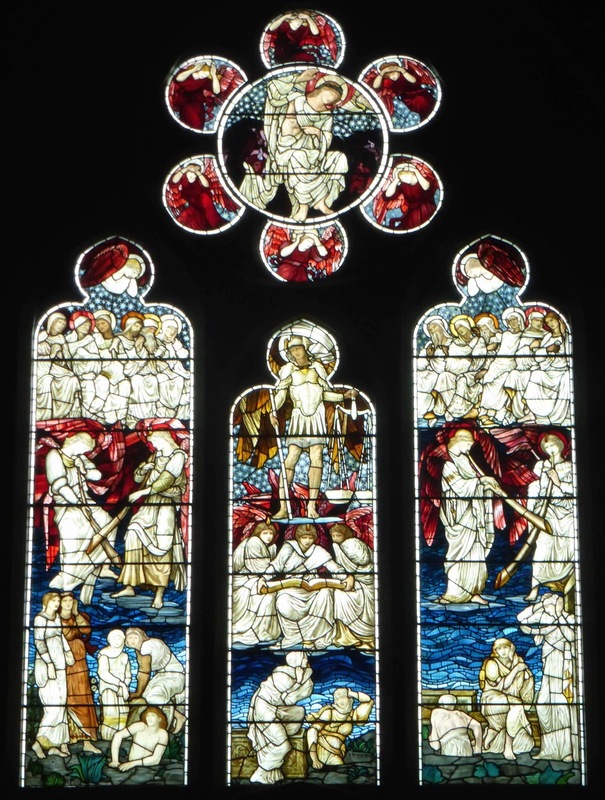 The south chancel window was made by James Hardman & Co in 1874; (the company lasted 170 years, from 1838 until 2008). 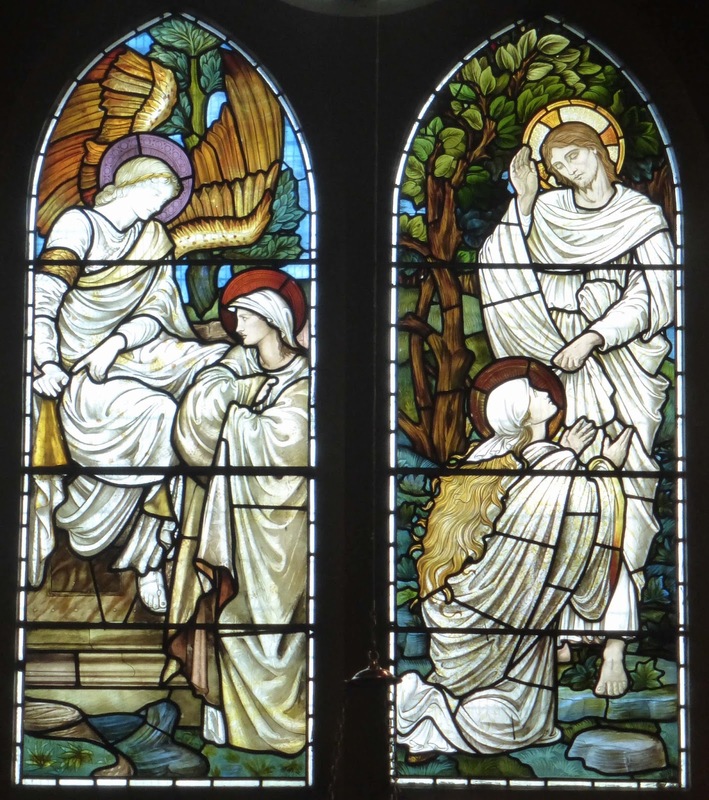 It shows the ministry of the angels in the life of Jesus. 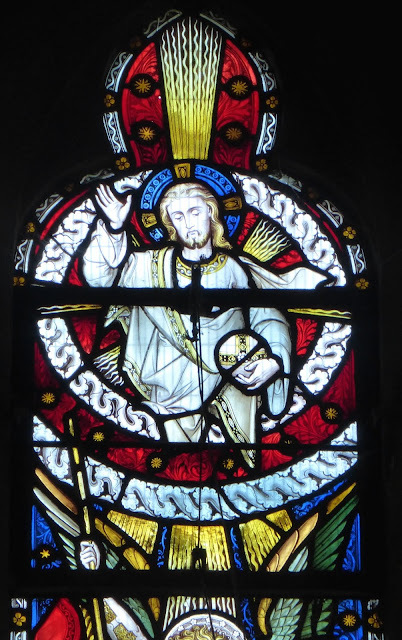 The roundel at the top has an angel holding a palm. 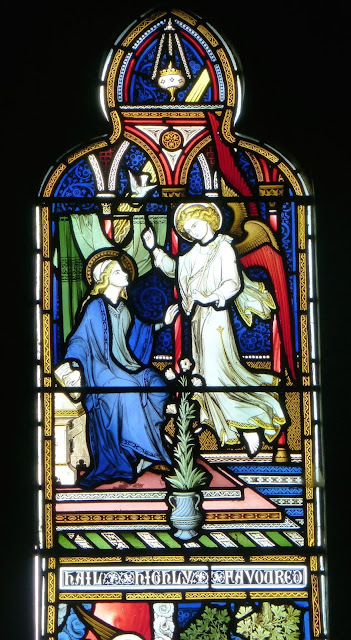 The top left light shows the Annunciation, that is, Mary being told by the Archangel Gabriel that she is to be the mother of Jesus. The bottom left panel shows Jesus in the Garden of Gethsemane, the night before the Crucifixion. 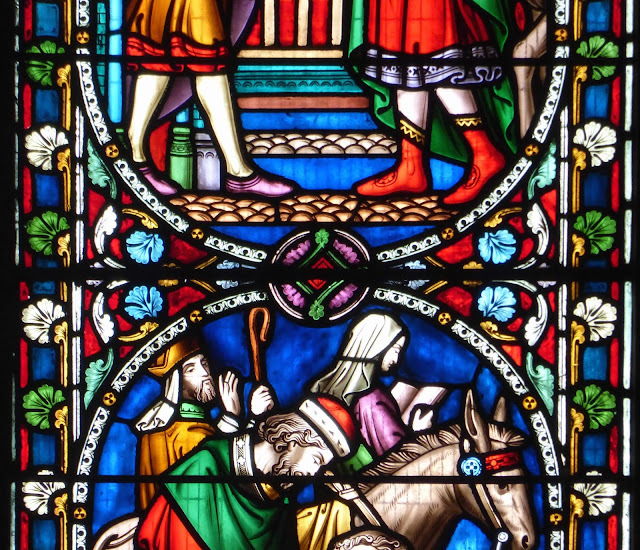 Top right shows the Holy Family's Flight into Egypt, on the run to escape King Herod's edict that all young children should be massacred. The bottom right light shows the Three Marys at Jesus' empty tomb after his Resurrection. This window has slabs of strong colours, reds and greens predominating, and a very linear design. I particularly like the stylised trees. The south window in the Downshire chapel is by William Wailes (1808-81), and dates from 1868. 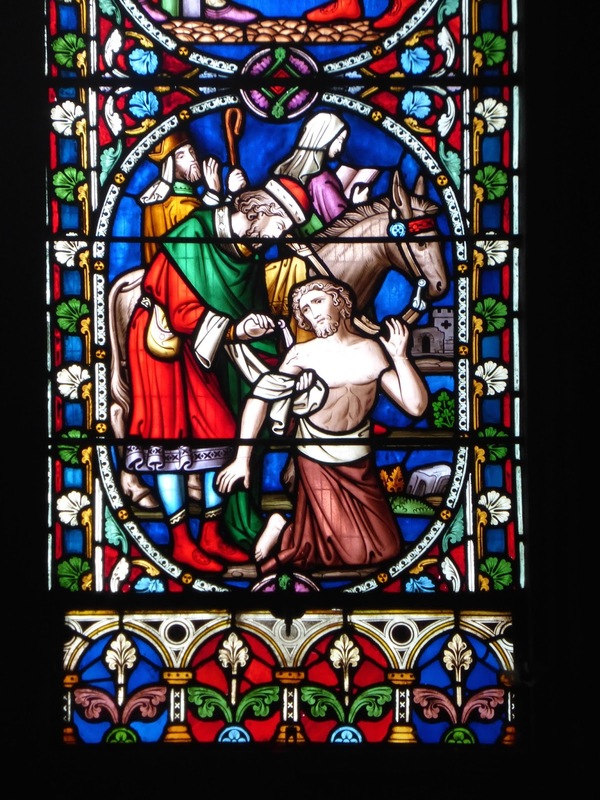 It shows the Acts of Charity, based on Jesus' teachings. 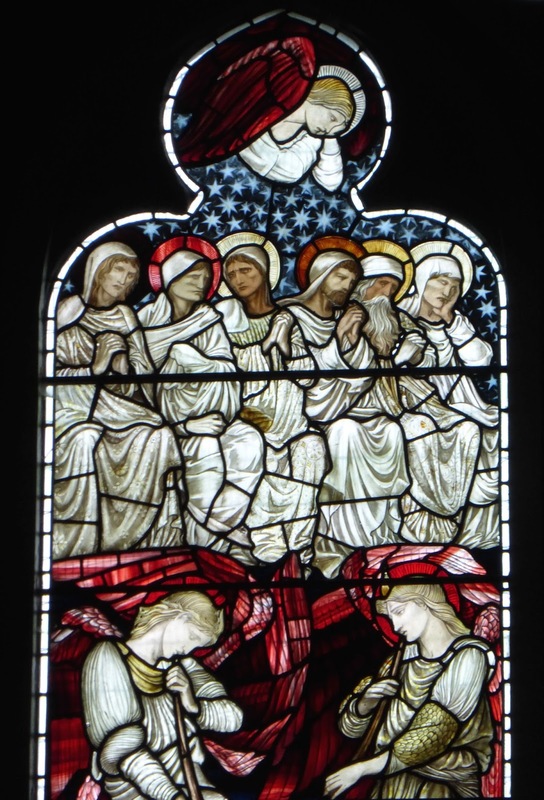 The trefoil at the top shows Christ blessing and being worshipped by angels, the top left panel strangers being welcomed, and the middle left panel the thirsty being given drinks. 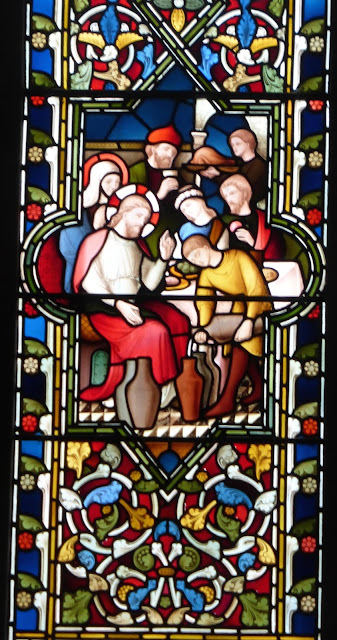 The bottom left shows the hungry being fed. The top central panel has the Good Samaritan paying the innkeeper. Below, the Good Samaritan rescues the injured traveller. The top right panel shows prisoners being visited. The middle panel the sick being visited. The bottom right shows the naked being clothed. 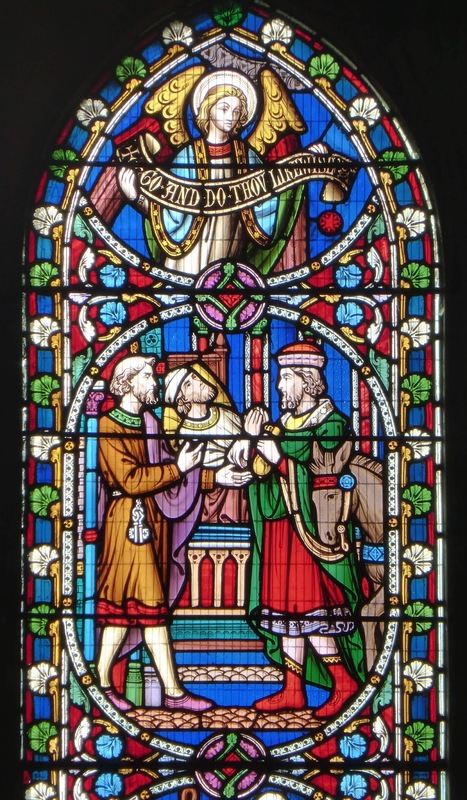 I like all the stately, stiff, hieratic gestures in this window; all the good deeds are turned into a kind of formal dance. Reds and blues predominate in this window. The floral borders are especially rich. 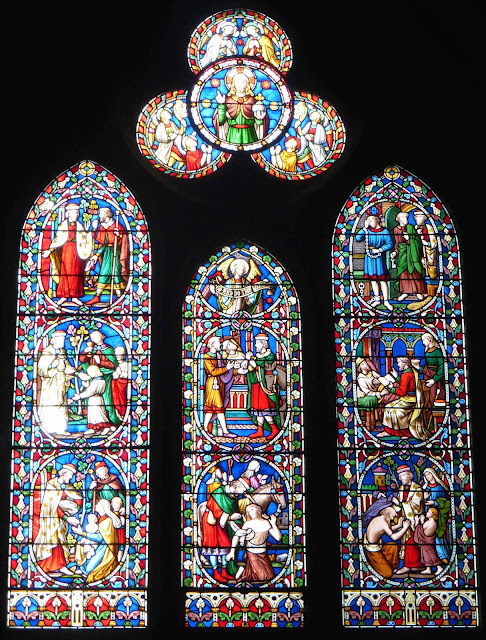 The south window of the south aisle dates from some time before 1879, and was made by the firm Lavers, Barraud and Westlake. 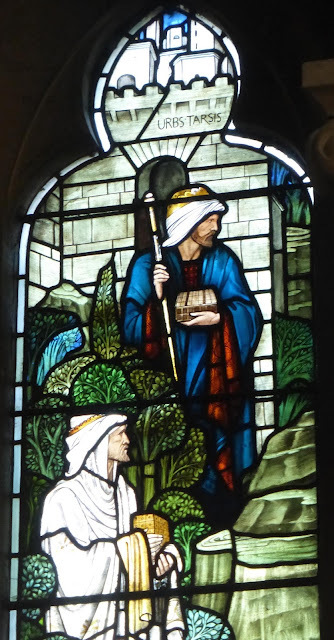 It shows parables and miracles of Jesus. 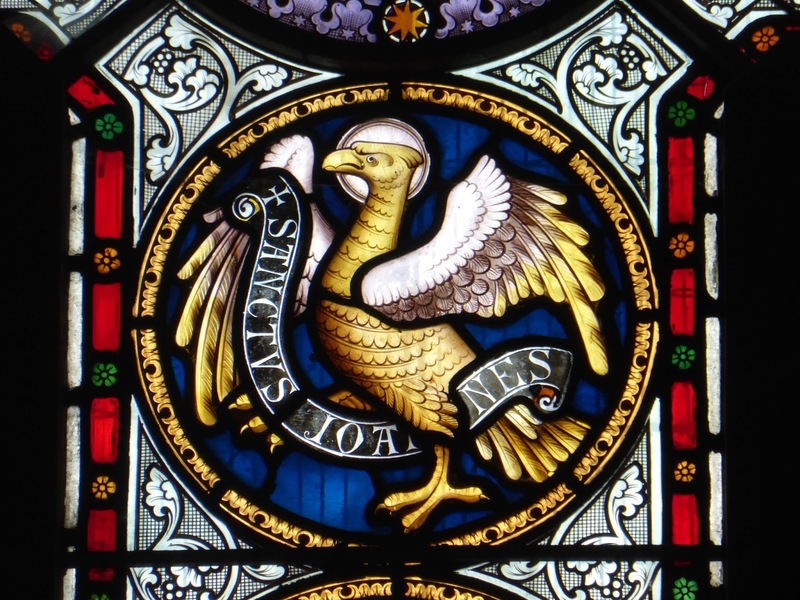 The roundel at the top has a pelican in its piety (a symbol of Christ's sacrifice). Jesus turns water into wine at the marriage in Cana. In this window the figures are overshadowed by the whorling foliage. 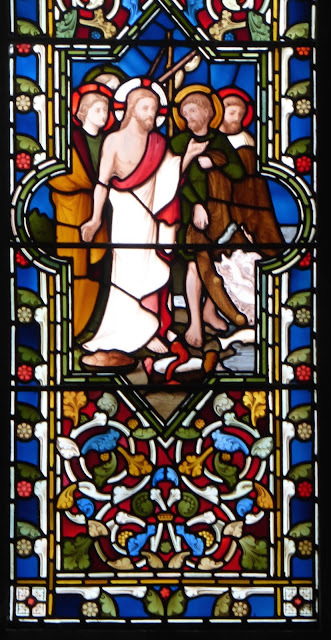 The south window in the baptistery is by the firm Michael O'Connor, and is undated (probably 1870s). 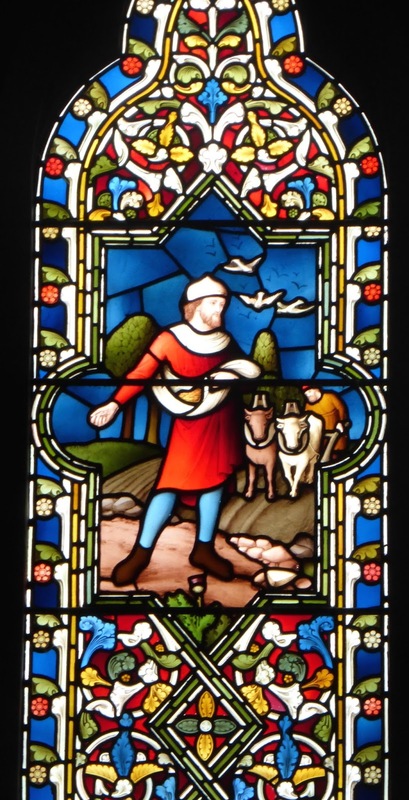 It shows Jesus the Good Shepherd. This is one of the weaker windows; the figure of Jesus is too painterly and sentimental, but the floral designs at the top and bottom are attractive. 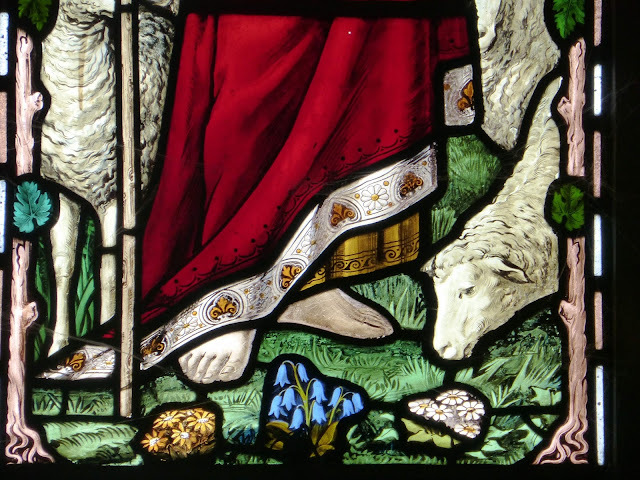 The sheep and spring flowers at the bottom of the main panel are also charming. 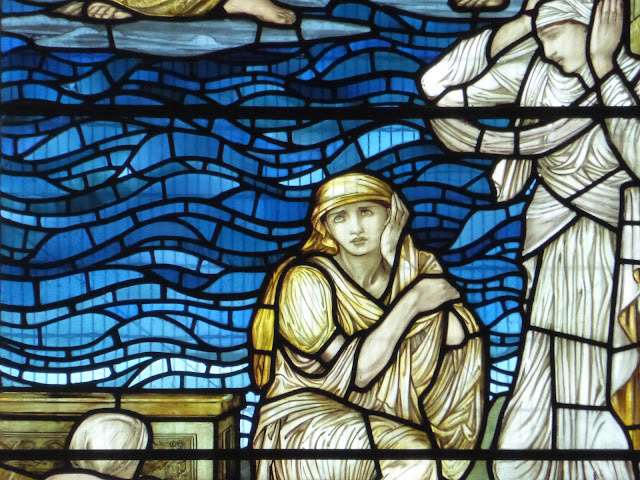 The baptistery west window is again by William Wailes, 1873. The main panel shows the baptism of Jesus. 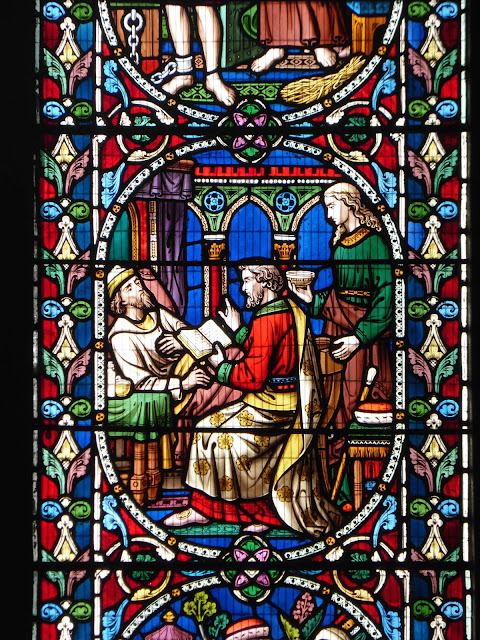 The main panel is nothing special, but the vigorous and lively symbols of the four evangelists at the top make this window worth seeing. 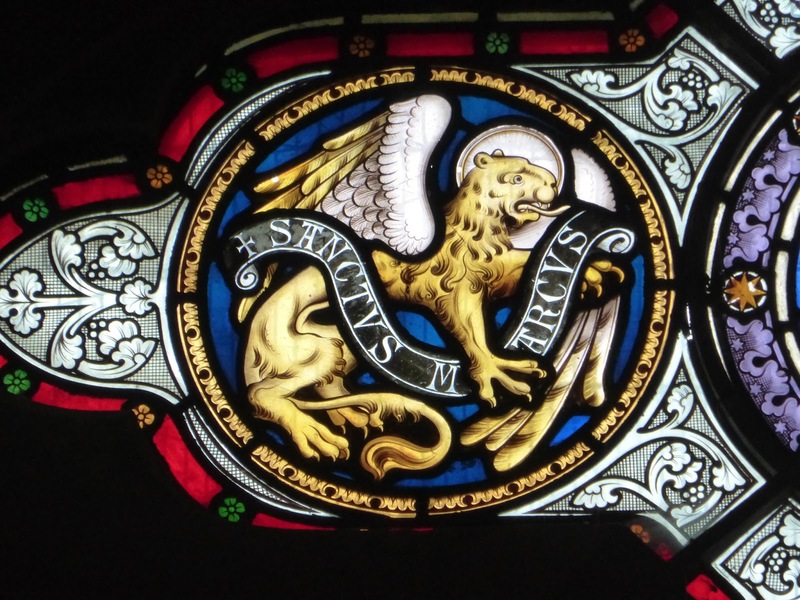 Compare them with the incompetently carved evangelist corbels in Felmersham, Beds if you think that medieval art is automatically better than that of the Victorians. 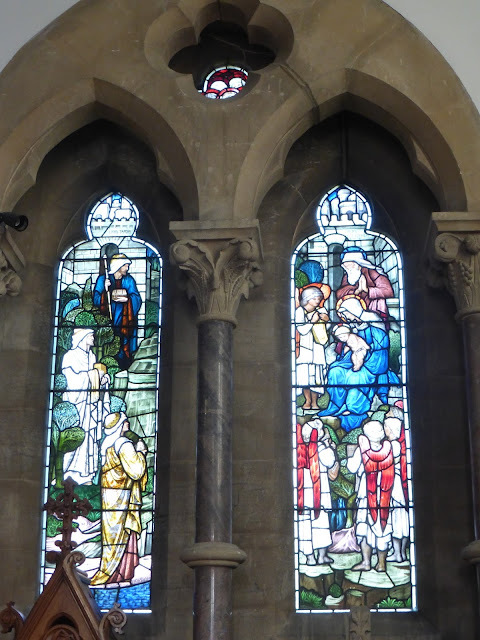 The west window under the tower is by Lavers, Barraud and Westlake, 1879. 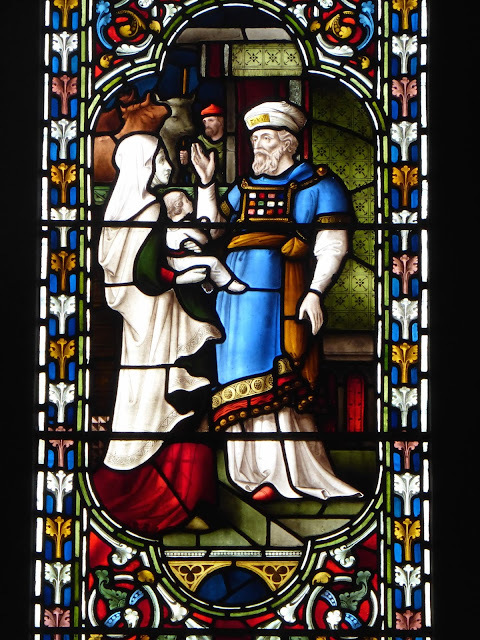 The two main panels show the children of the Old Testament, while the quatrefoil at the top shows Moses with the Ten Commandments. Joseph presents his sons Ephraim and Manasseh to his father Jacob for blessing. Hannah presents her son Samuel to the priest Eli for blessing. 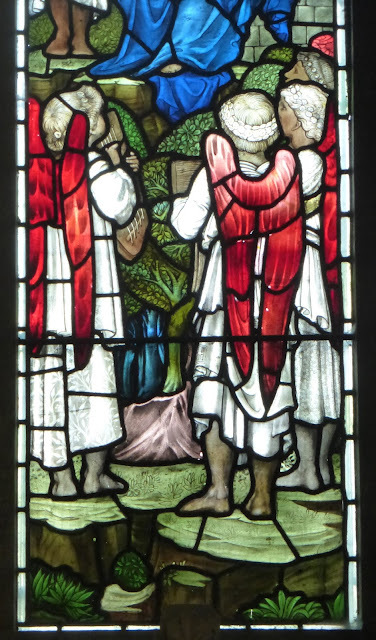 The figures are too naturalistic and sentimental, and the colours of the pictorial panels too drab, but once again the foliage borders are wonderful. 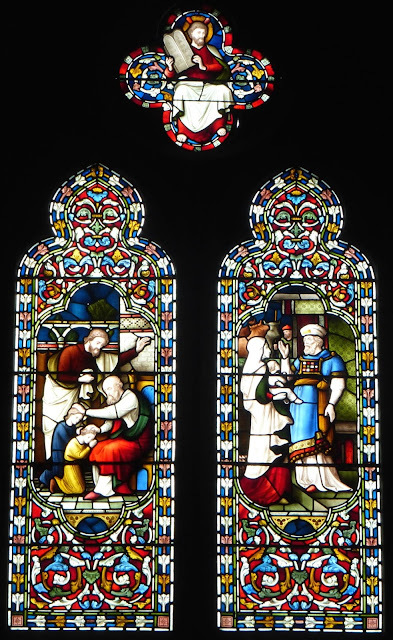 William Wailes was responsible for the west window of the north aisle, showing the daughters of Jephthah and Jairus. It was made in 1867 (the earliest in the church). Jephthah vows that if he leads the Israelites to victory over the Ammonites, he will gives thanks by sacrificing the first person who greets him when he returns home. He gets his victory, but is greeted by his daughter, his only child, dancing and playing the tambourine. 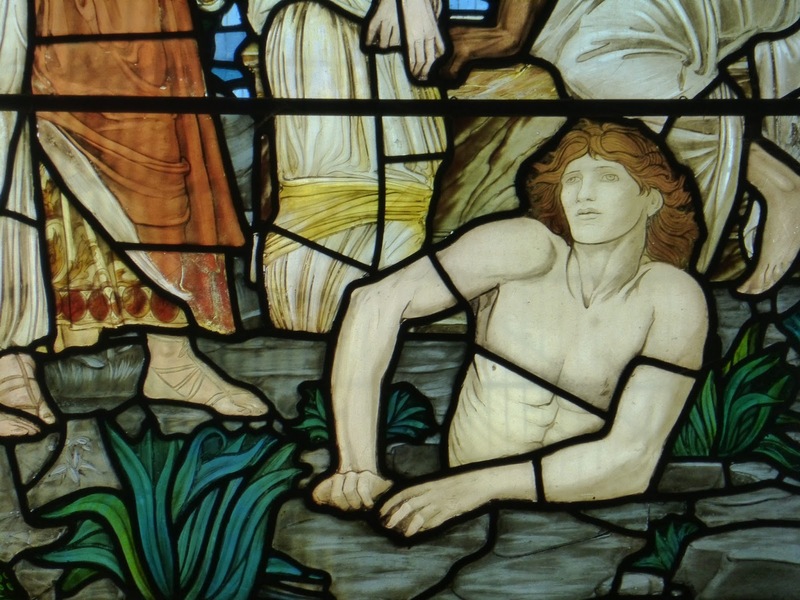 He is distraught, but fulfils his vow. 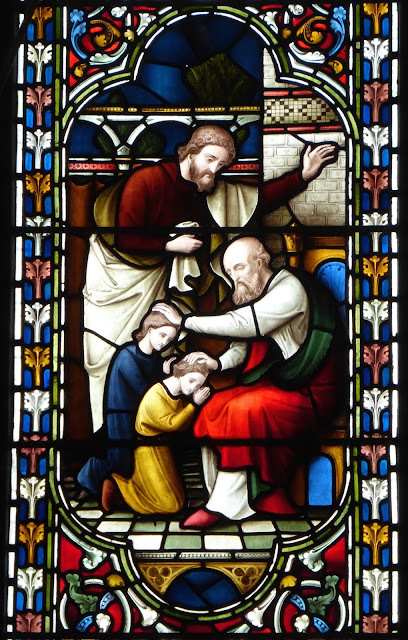 Jesus restores Jairus' daughter to life. 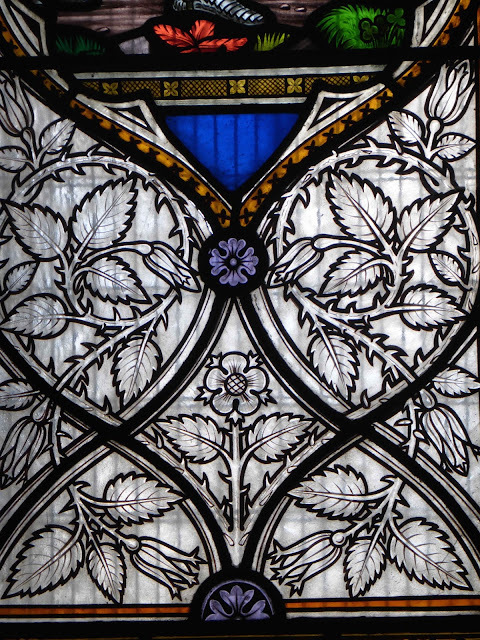 This window is unusual in that the foliage (in this case roses) borders have been left as outlines; whether this was an aesthetic or financial decision I don't know. 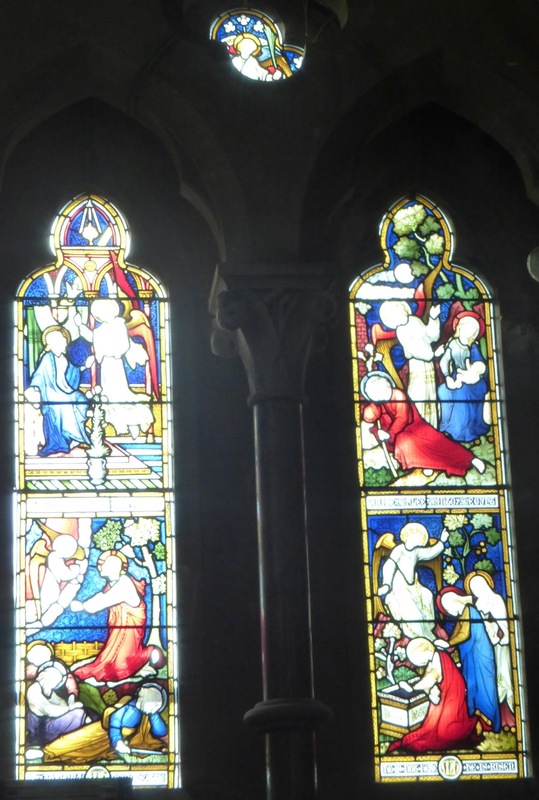 The two windows in the north wall of the north aisle suffer from the presence of the new (1977) church rooms, immediately to the north, which cut off most of the light. 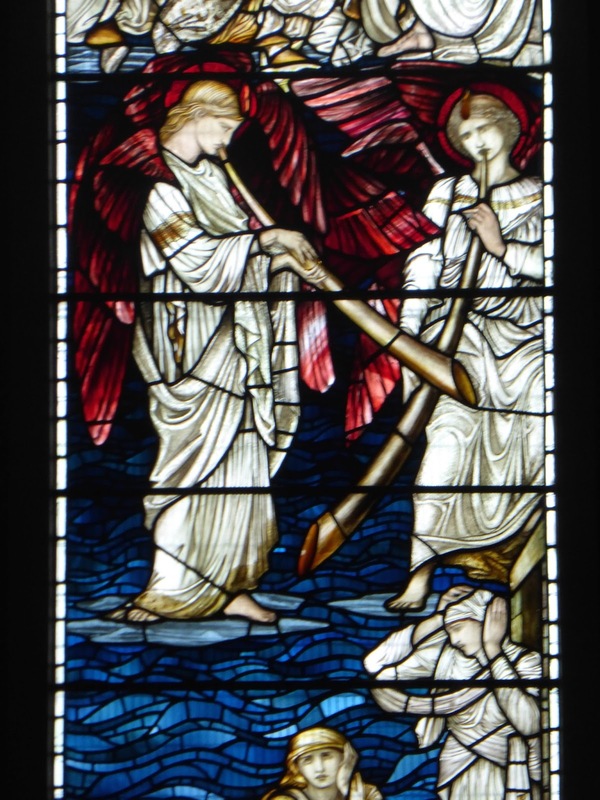 The westernmost window in the north aisle is by Charles Eamer Kempe (1837-1907), dates from 1893, and shows Hope, Love and Faith. 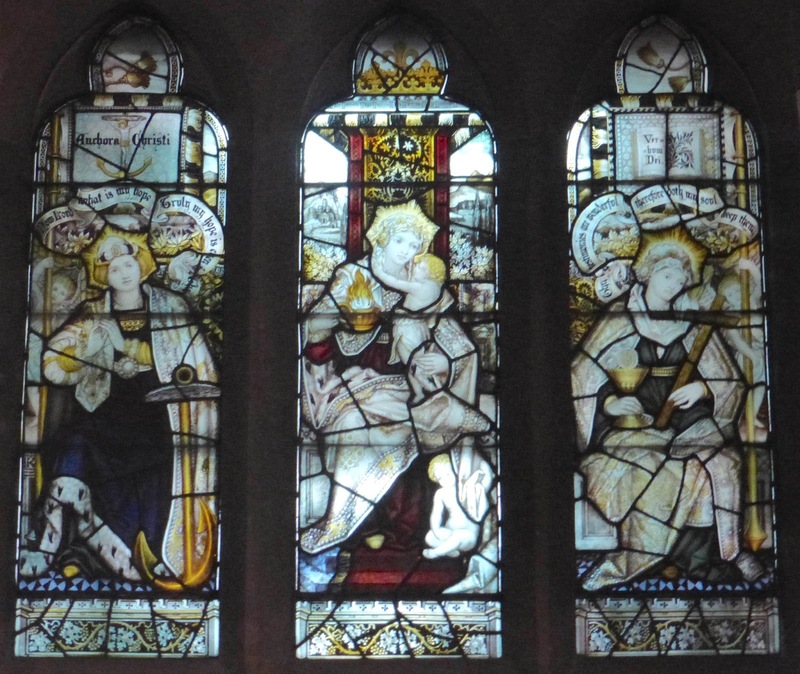 Kempe was a prolific maker of stained glass in the later Victorian period, so prolific that sometimes it seems that for a church to have a Kempe window is as obligatory as having a font or a flower rota or a chipped vase on a windowsill. If only his windows were as useful. 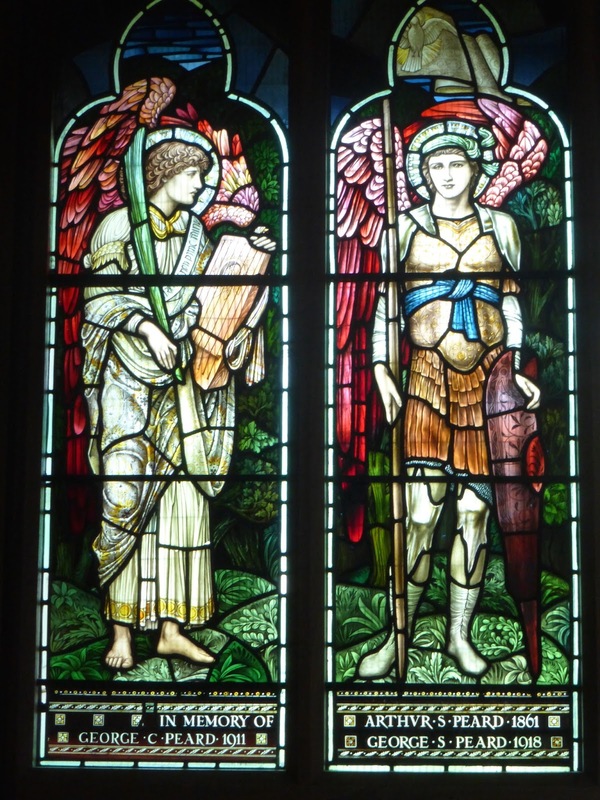 I admit that some of his windows are better than others, and that some of them, especially the earlier ones, have their merits, especially little details. But most of them are drab - he is ridiculously overfond of dark greens and browns, but also uses too much plain white glass, which drains what colour there is from the window. 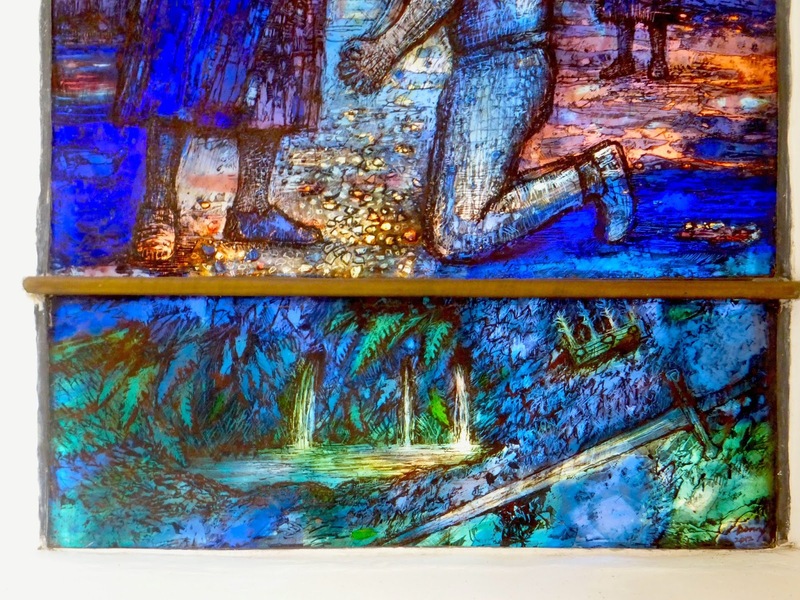 He makes little allowance for the medium, treating the glass like canvas. They're often hopelessly overcomplicated and fussy in their design. 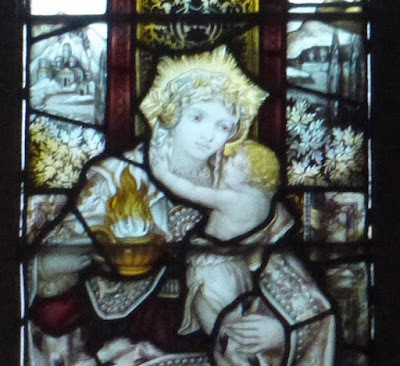 I've already criticised some of the other windows in Easthampstead for having sentimental figures, but Kempe outdoes them all. 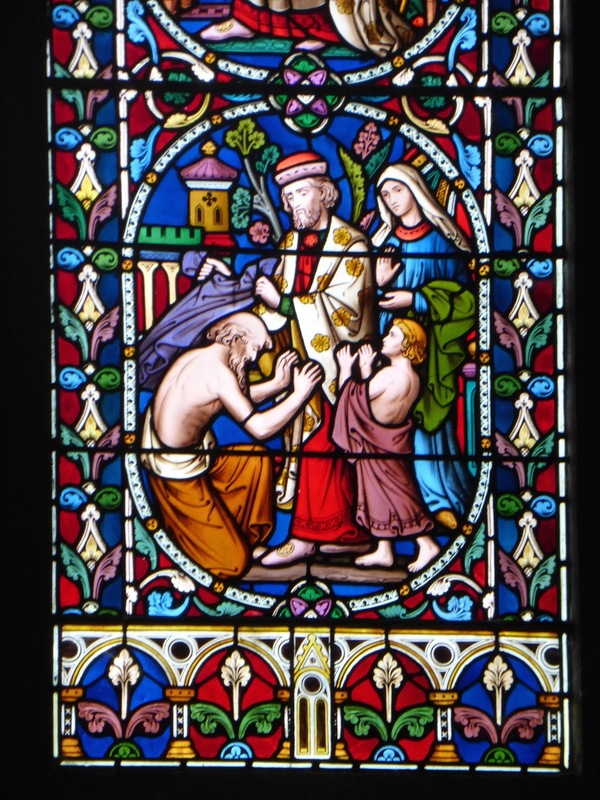 He takes sentimentality, especially of faces, to a different level; his figures are meant to look saintly but simply simper. He tries to achieve holy splendour, but tumbles into saccharine bathos. 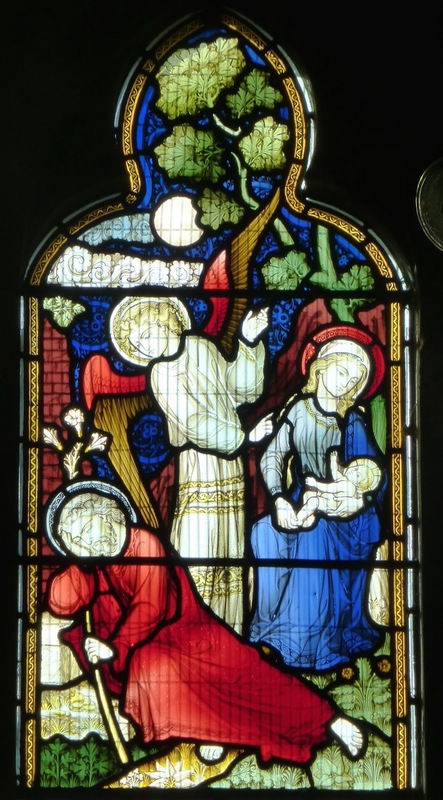 Compare Kempe's version of the Virgin and Child with Hardman's (from the chancel south window), for example. 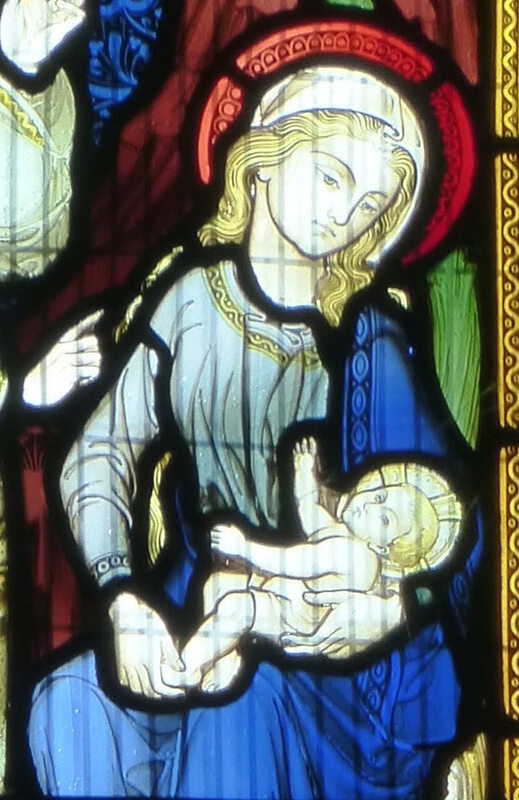 The former attempts photographic realism, with very painterly (and unsuitable for stained glass) shading of the heads and hands, and glutinous expressions. The latter sketches the features in a few dexterous brushstrokes, based on stylised medieval models, and is infinitely more beautiful and affecting. You might have got the idea by now that I don't like Kempe, and so I don't think it a great loss that the annex obscures his window. 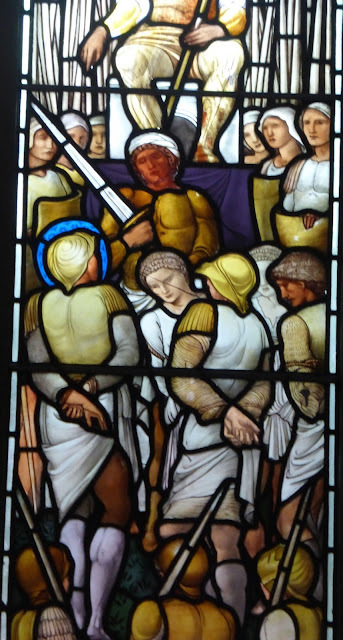 Unfortunately, it also cuts off the light from the next window, by Burne-Jones, dating from 1883, depicting the Martyrdom of St Maurice. 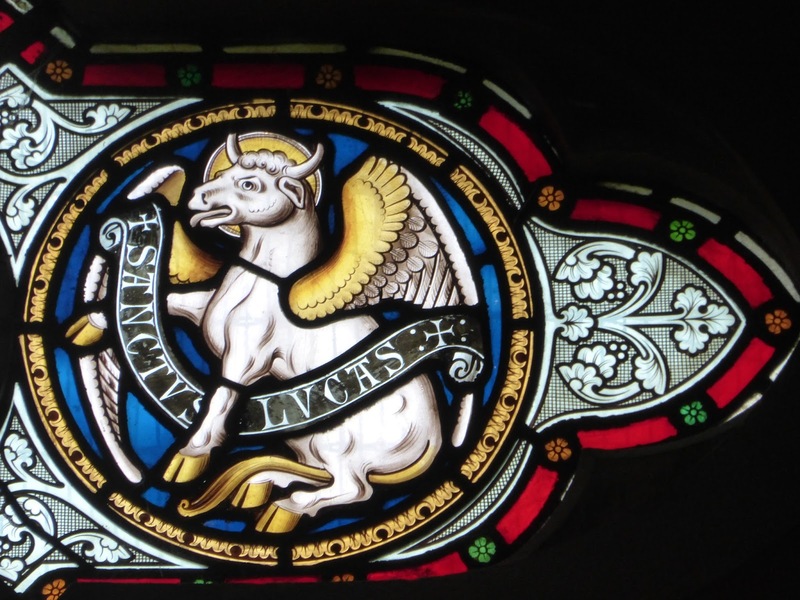 The two pictures above were taken a few days apart at roughly the same time of day, and you can see how poor the light is, especially in the bottom half of the window, so all the colours are deadened. This isn't a common subject for Victorian stained glass (though individual figures of St Maurice are to be found). St Maurice was a 3rd century Roman soldier, and (according to the story) a leader of a legion of Christian soldiers (this was of course before Christianity became the official state religion of the Roman Empire in 380). 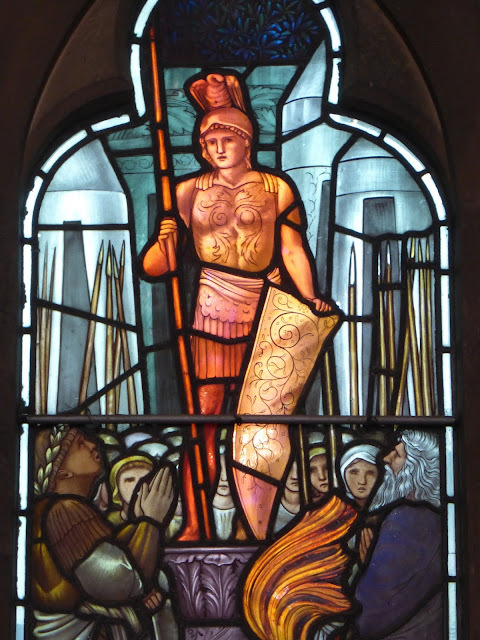 He refused to order his men to take part in wanton slaughter, or to worship Roman gods. Consequently, he and his whole legion of over six thousand men were executed by order of the Emperor Maximian. 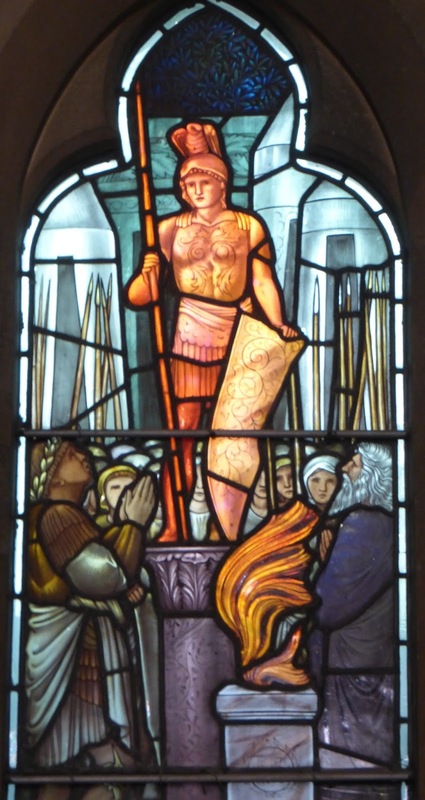 In the top of the left light, Maximian (bottom left) makes a sacrifice to a life-size golden statue of Mars. The lances and very tall tents set up a strong vertical rhythm. At the bottom Maurice (on the right, with raised hand) is arrested. All eyes are on him, which obviously draws our attention to him. In the right light, Maximian sits in judgement, occupying the same position in the image as Mars, suggesting that he is hubristic. The lances are crowded behind him even more thickly than they are on the left, looking very aggressive and threatening. 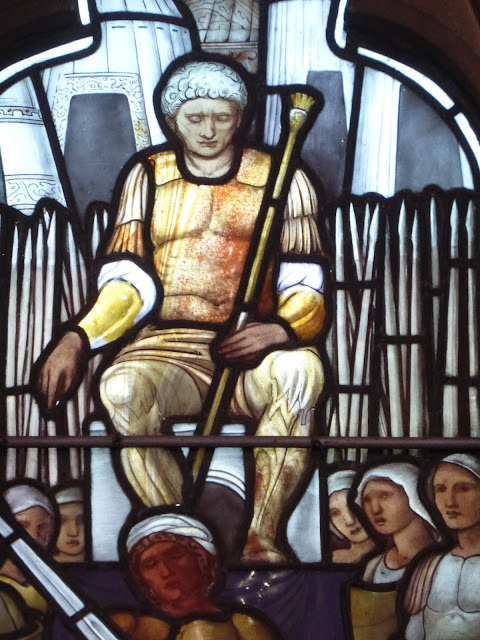 Maximian himself, however, looks tired and not at all war-like, as if he regrets condemning Maurice to death. 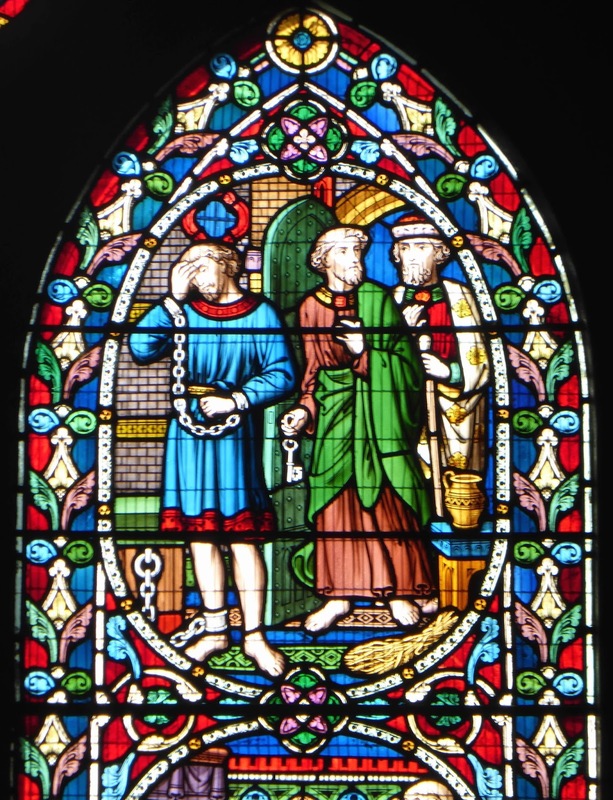 Maurice is the haloed figure on the left, half way down the light, with his hands tied behind his back; some of his subordinates have also been arrested. 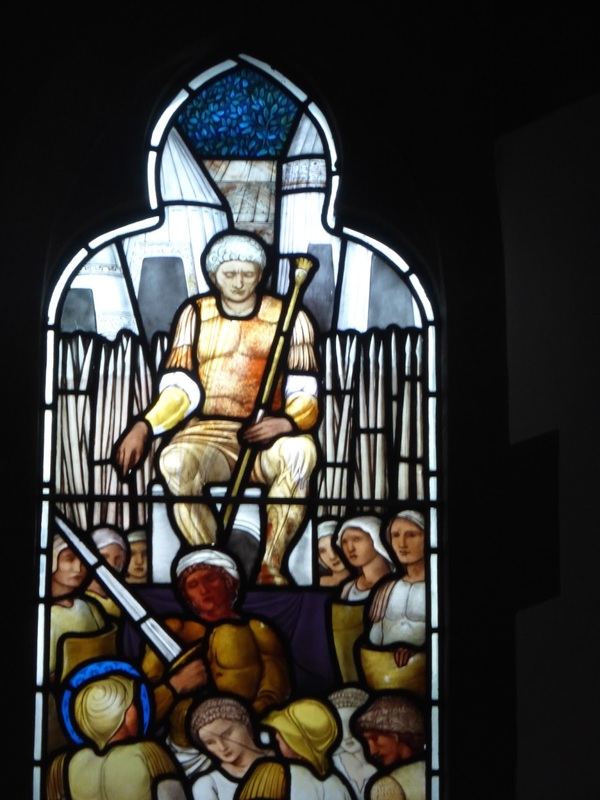 A sword is flourished above him threateningly; it is clear that he is going to meet a shockingly bloody death. 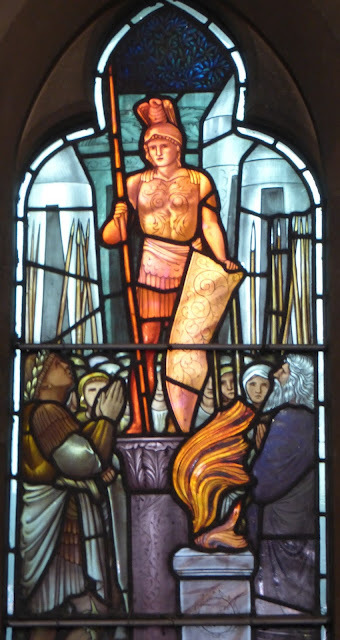 The perspective of both lights is very non-naturalistic; the scenes have been stretched vertically, as if they're taking place on a very steep hillside, to make all the figures visible, which effectively isolates and imprisons Maurice in the right light, trapped between the lances at the top and the wooden barrier at the bottom, against which soldiers nonchalantly lean. 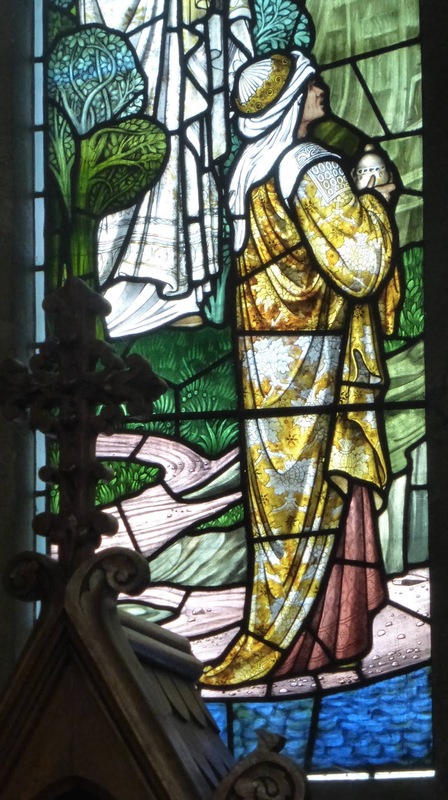 The east window of the north aisle is also by Burne-Jones, from 1878, depicting St Mary Magdalene on Easter morning. 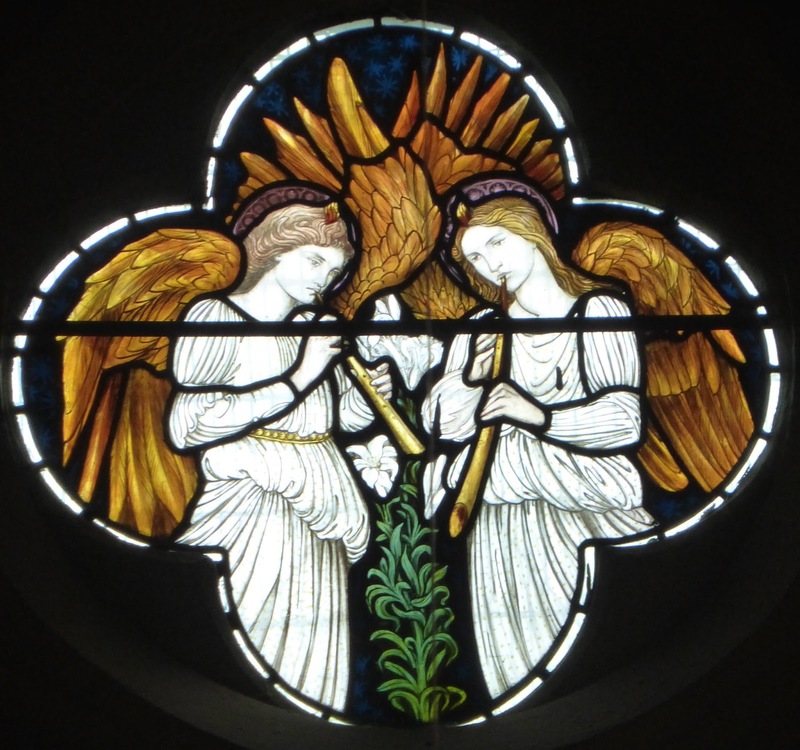 The quatrefoil at the top shows two rather serious-looking angels playing instruments that look like recorders made out of animal horns. Between them is a lily, symbol of purity. 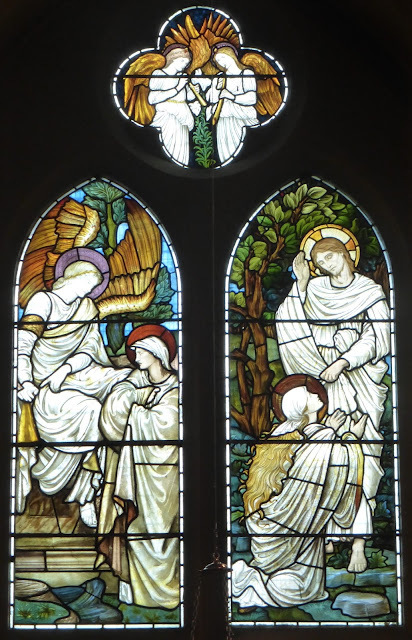 The lancet on the left shows Mary at Jesus' tomb, where an angel tells her that he has risen from the dead. That on the right depicts the moment when Mary sees the risen Christ and he says to her 'Noli me tangere', ('Don't touch me', which has always seemed to me an odd, literally and metaphorically off-putting thing to say in the circumstances). This is the least satisfactory of the Burne-Jones windows in the main church (but it's the one chosen for the cover of the church guidebook, so not everyone agrees). 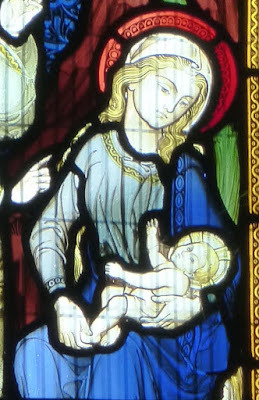 The robes are luxuriant, and Mary's hair in the right lancet equally so, but the figures seem conventional (compare this version of Christ with the dynamic one in the east window), and the colours unexciting. 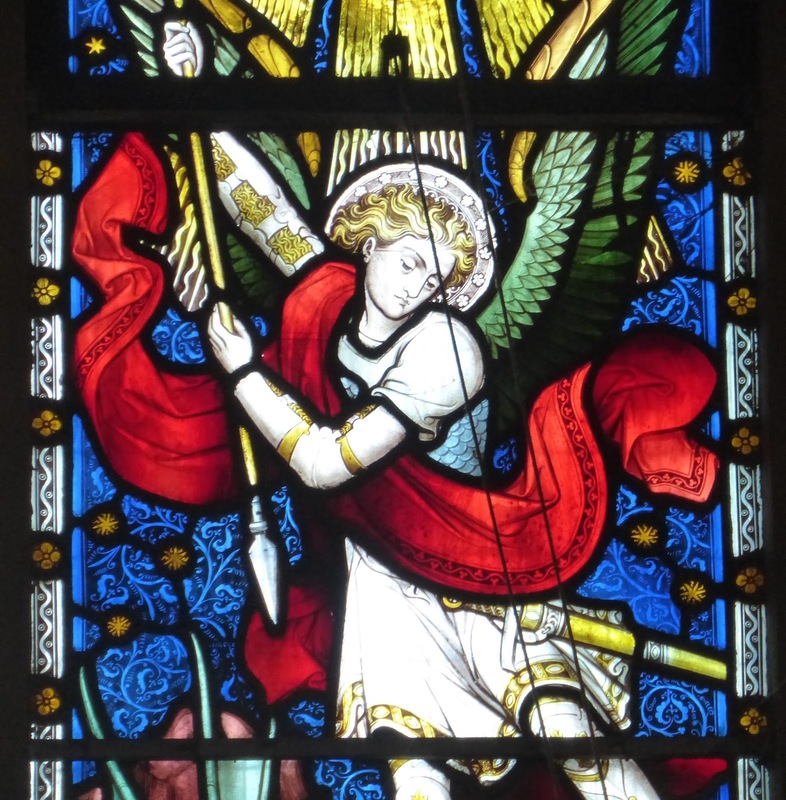 The westernmost window on the north side of the chancel is another by Hardman, 1875; it depicts St Michael defeating the Devil. 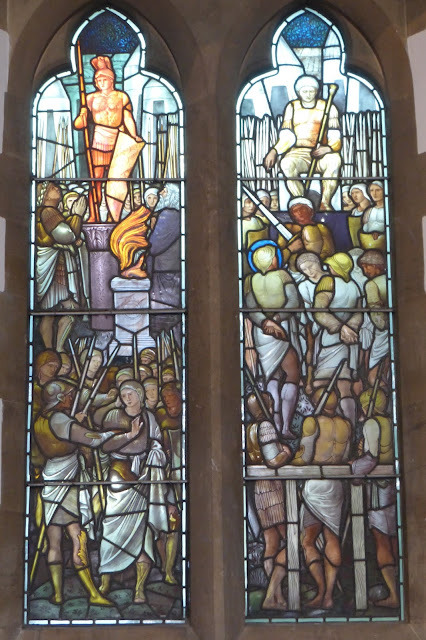 The window is brilliantly coloured and full of drama. 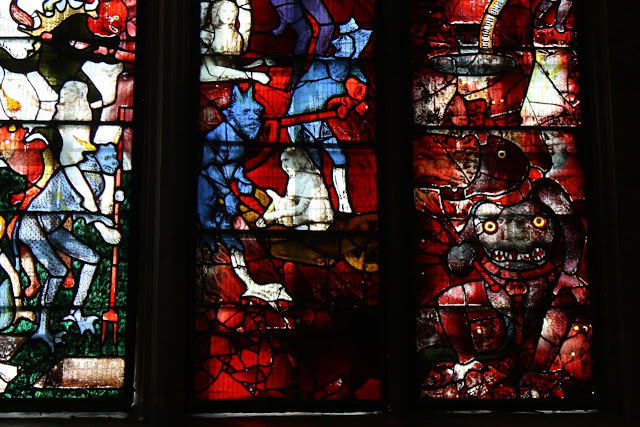 The Devil becomes an almost sympathetic figure, with a lost or haunted expression on his face. 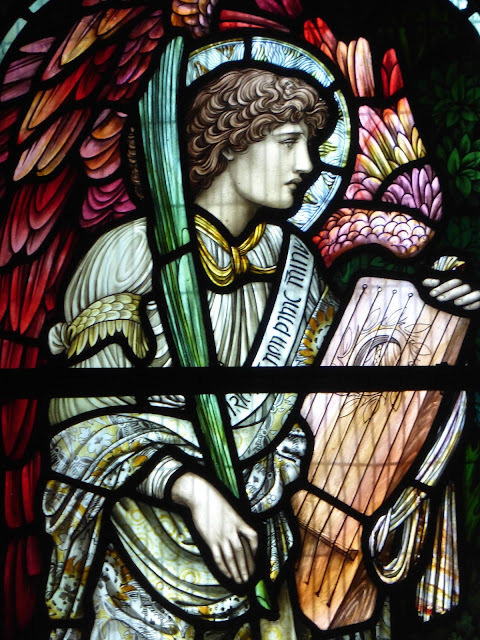 His wings are perhaps leathery, in contrast to the feathers of Burne-Jones' angels. 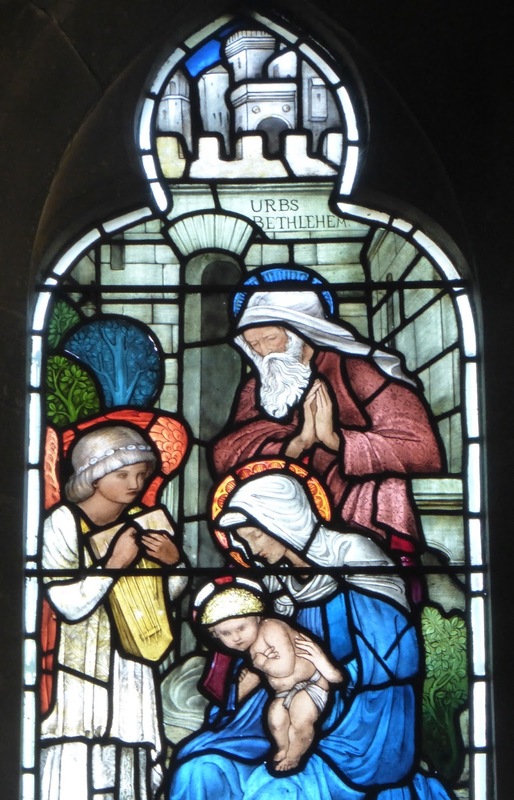 The last window in the church proper is another Burne-Jones, 1885, depicting the Magi visiting the infant Jesus. 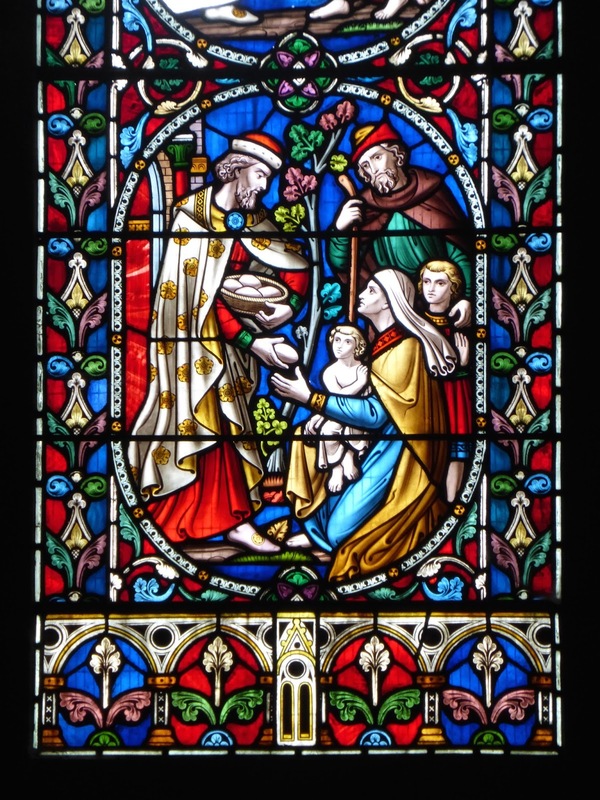 In the left light, the Three Wise Men, carrying their gifts of gold, frankincense and myrrh, set out from the city of Tarsus to visit the newly-born infant. They look off to the right, towards Jesus several hundred miles away in Bethlehem in the other light. I like the trees, which look as if they're from a model village (this is intended as a compliment) and the richly embroidered costume of the bottom figure. The right light depicts the Holy Family being adored by angels. Jesus seems to be twisting mischievously as if to escape from his mother's embrace, a charming detail. The quatrefoil at the top has a choir of angels, but, because of the architectural surround, short of standing on a ladder it's impossible to see complete. The photo at the top was obtained by standing on a seat and holding the camera above head height. 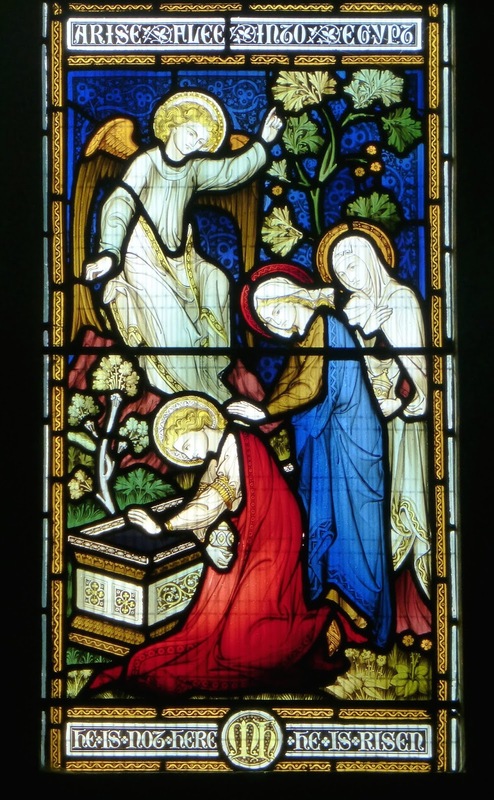 One more Burne-Jones window is found in the annex; it was originally in the north aisle, where the door to the annex is now. 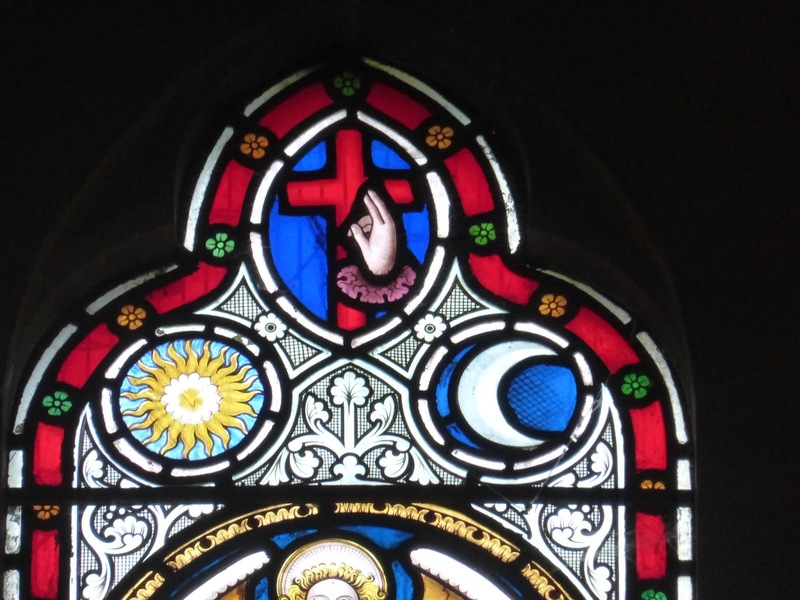 Even when the church is open, the annex is often locked and thus the window is inaccessible. It was installed in 1914, that is, some years after Burne-Jones' death, but was made by the firm Morris & Co following his designs. The firm survived until 1940, but their later products often fell short of their Victorian high standards; however, this window is imposing. It shows St Michael with angels carrying musical instruments and palm leaves. 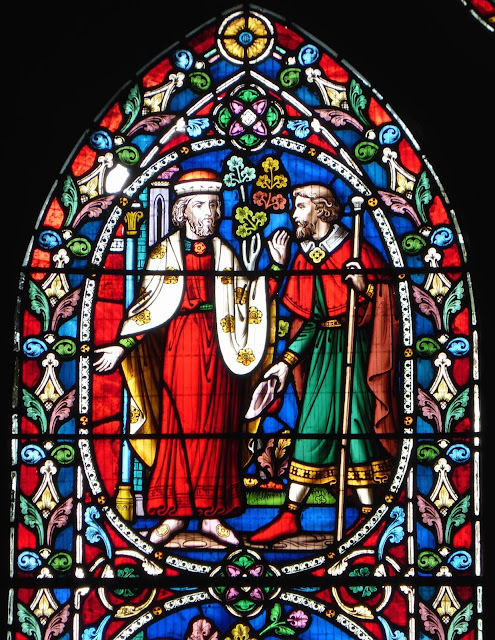 There's one final window, not in the main body of the church, but in the porch. 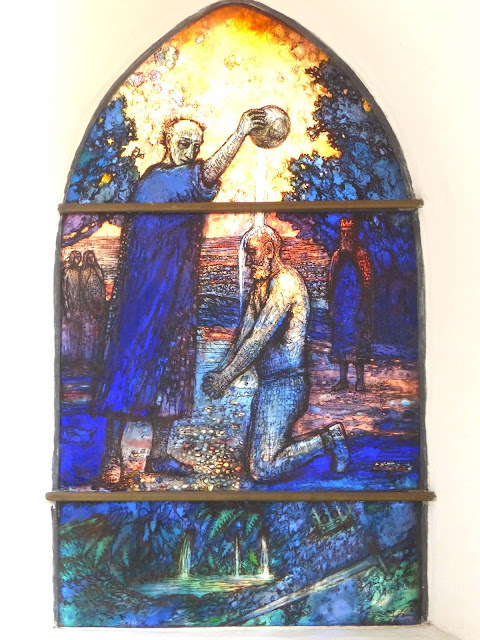 It's by Thomas Denny (about whom I've written before: see here), dates from 2013, and depicts the baptism of Cynegils, King of Wessex, by Bishop (later St) Birinus, in c.635. This event, one of the key events in early English history, possibly took place in Easthampstead. In the background can be seen Cynegils' daughters and Oswald, King of Northumbria, who became Cynegils' godfather and son-in-law. 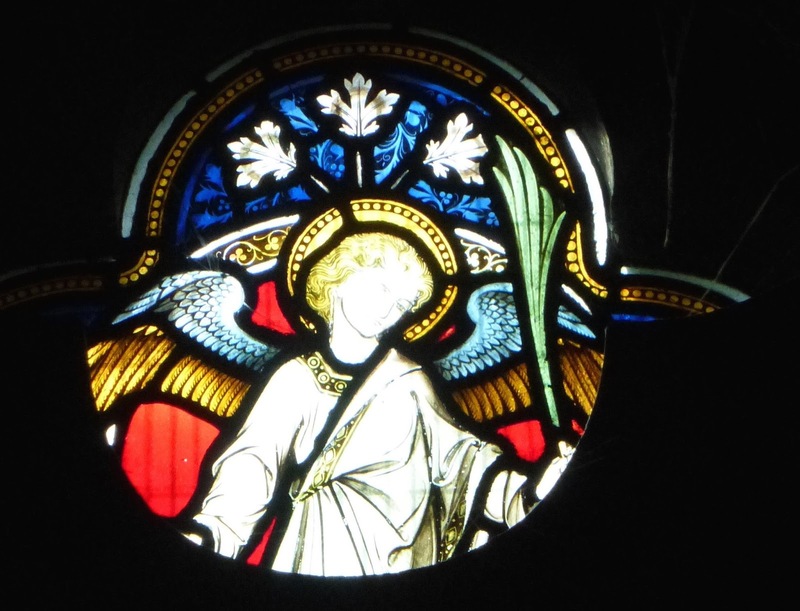 This glowing window is a worthy successor to Burne-Jones and Wailes. The church is currently open only on Fridays, though this fact is not advertised on their website (which claims that the church is open every day) nor on any notice in or outside the church, so visitors who arrive at any other time will be disappointed and not realise that they can gain access if they return in a few days. A simple notice on the door would rectify this. It's certainly worth persevering in your attempts to get in. (1) This is from the 1st edition, 1954; it was allowed to stand in the 2nd, 1970, but was, thankfully, expunged from the completely rewritten 3rd, 2014, (though if I'd been the reviser I think I'd have preserved Pevsner's original comment in a footnote as a contribution to the history of taste). 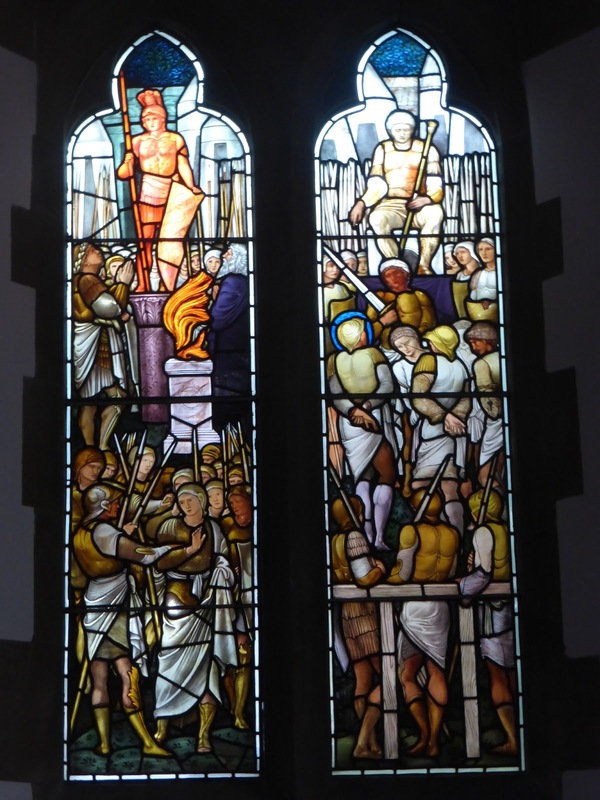 (2) In the same year I visited Laughten-en-le-Morthen church, South Yorks/West Riding, where I've not returned since. 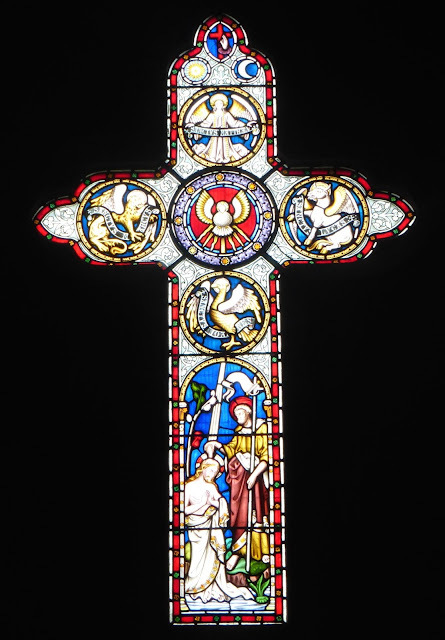 I remember thinking that one window, probably on the south side of the chancel, was just about the ugliest thing I'd ever seen. I can't find any pictures of it online, but maybe it was Victorian, and maybe now I'd really like it. I shall revisit and see one day. 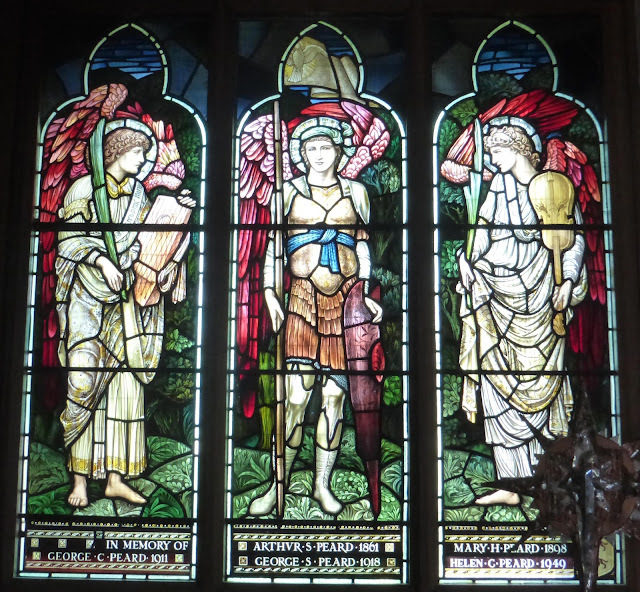 (3) William Waters' Angels and Icons (2012), although it covers only 1850-70, and Peter Cormack's Arts and Crafts Stained Glass (2015), which of course covers only the later Victorian and earlier 20th century periods, are the only major exceptions I'm aware of. (4) An Italian bookseller on Abebooks currently has a copy for about £60 inc. p+p, which I'd snap up if I were you. 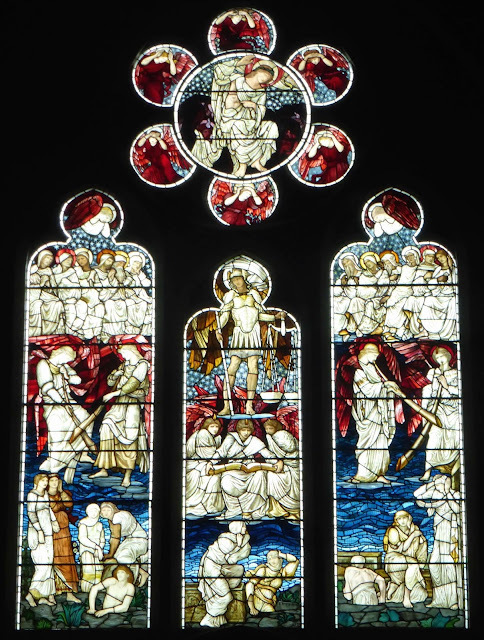 (6) Other Victorian Last Judgement windows can be found at Berkhampstead, Herts, (7) Bury St Edmunds cathedral, Suffolk, Kings College, Cambridge, Chipping Camden, Glos, Hanley Castle, Worcs, South Dalton, East Riding, Taunton, Som, and Windsor, Berks. (8) The 'sheep', those worthy of salvation, are on Christ's right, while the 'goats', the damned, are on his left, which seems to me both speciest and sideist. It's been a couple of months since I last posted; I've been away from home more often than I've been there, which doesn't make writing, or anything else, easy. I'm hoping that this period of semi-exile is approaching its end, however.